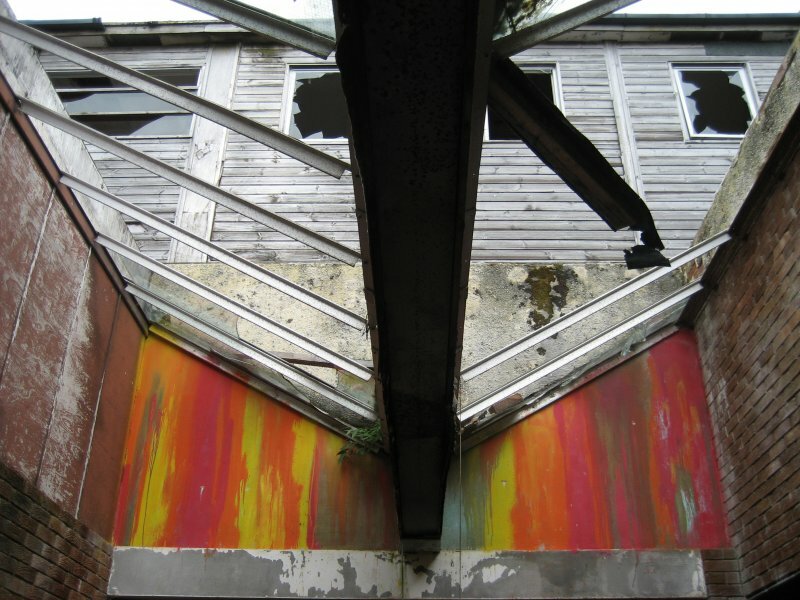 View of roof of main stairwell. Accommodation block. View from south. Central block. View from west. Central block. View of graffiti art by Derm from south. Accommodation block. View of graffiti art by Derm from South. Accommodation block. View of graffiti art from south east. Accommodation block. View of graffiti art from east. Accommodation block. Detail of graffiti art by Remi/Rough and Stormie Mills. Laundry block. 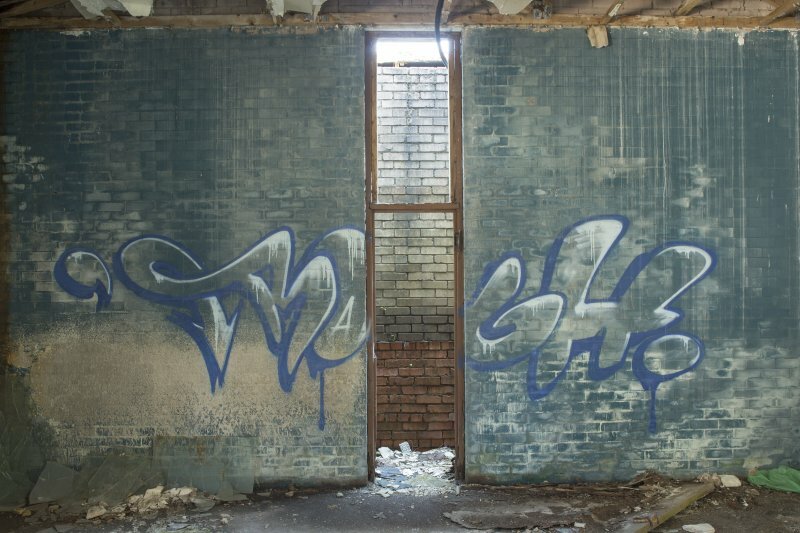 View of graffiti art by Remi/Rough from west. Central block. View of graffiti art by Stormie Mills from east. Central block. 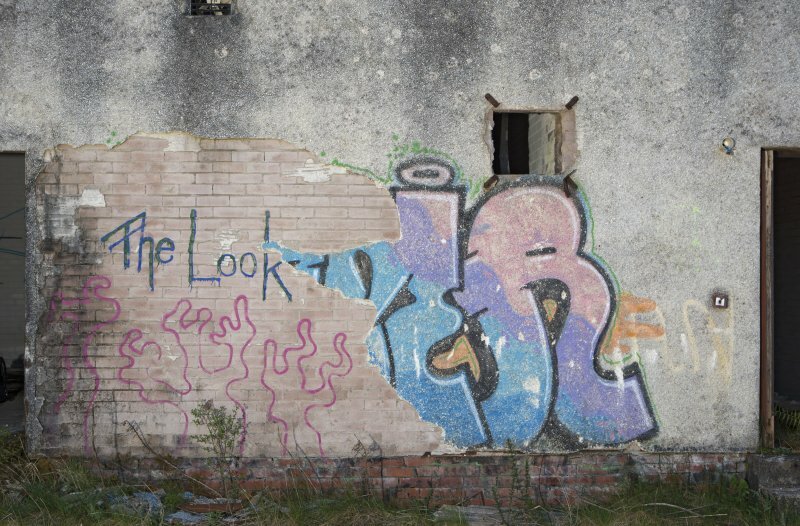 View of graffiti art by Stormie Mills from north west. Central block. View of graffiti art by Stormie Mills from south. Central block. 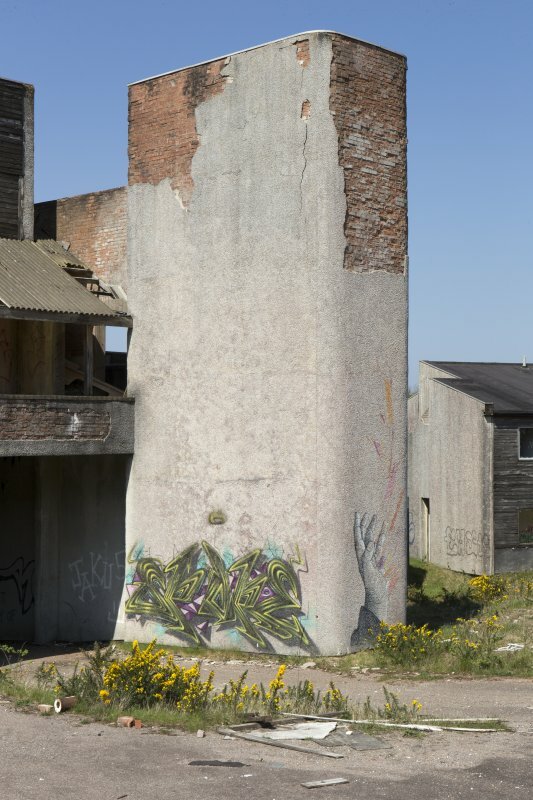 View of graffiti art by Bamr from north west. Central block. 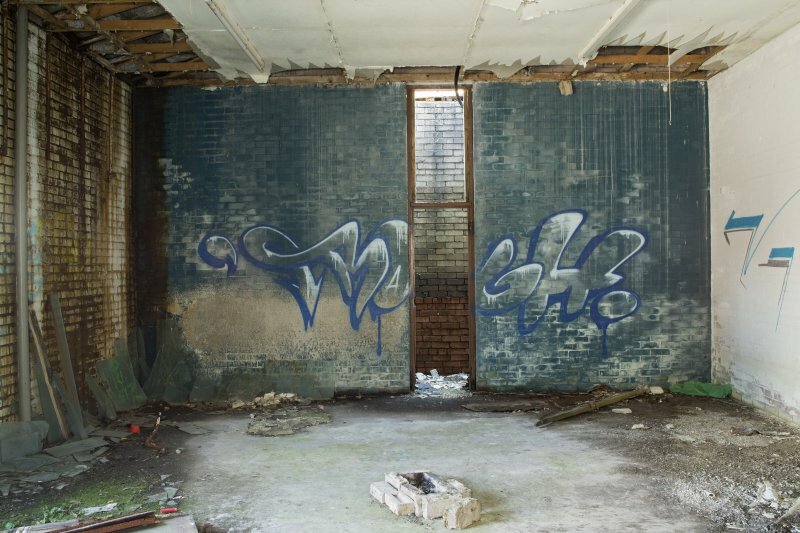 View of graffiti art from west. Laundry block. 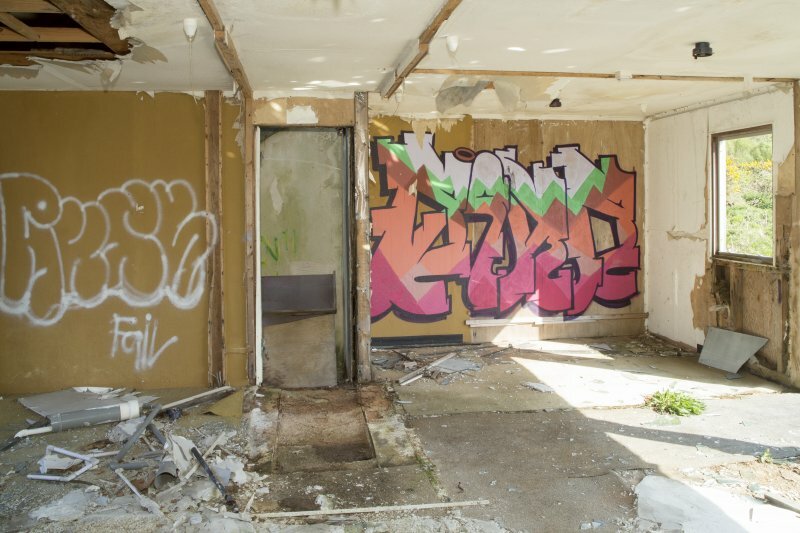 View of graffiti art from south west. Laundry block. View of graffiti art from south east. Laundry block. View of graffiti art from north. Central block. 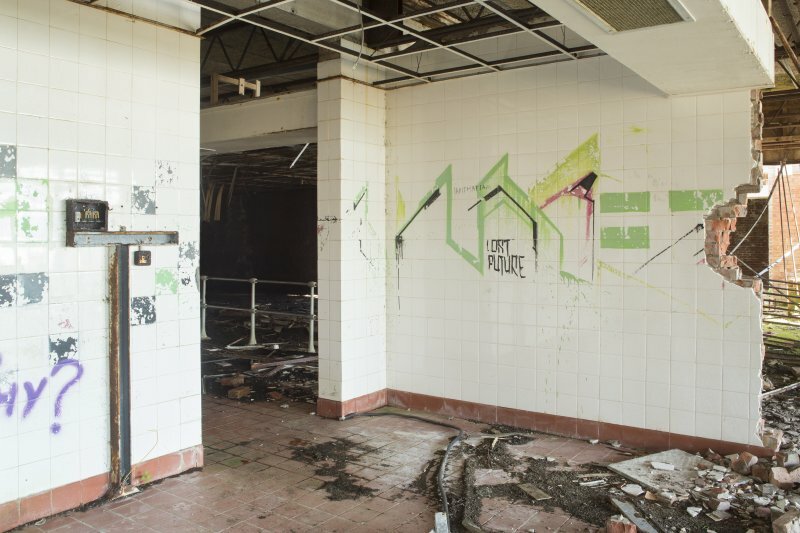 View of graffiti art by Stormie Mills from west. Central block. Detail of graffiti art by Derm. Central block. Detail of graffiti art by Stormie Mills and Derm. Accommodation block. 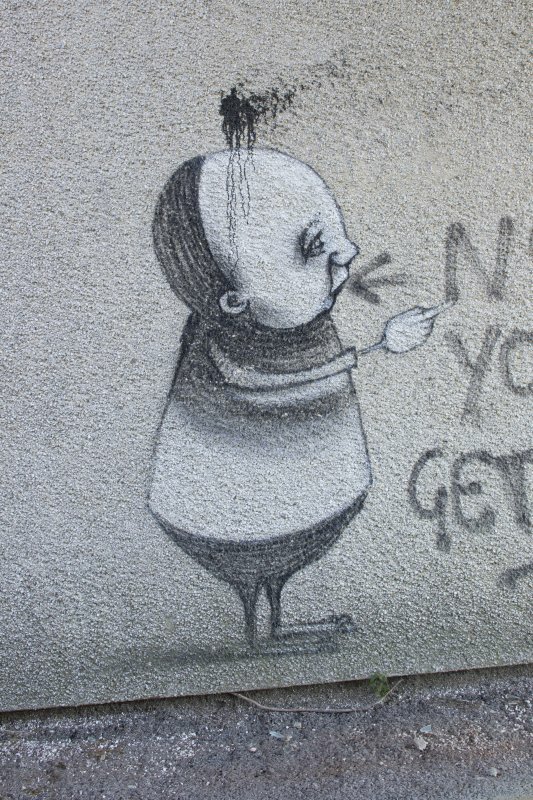 Detail of graffiti art. 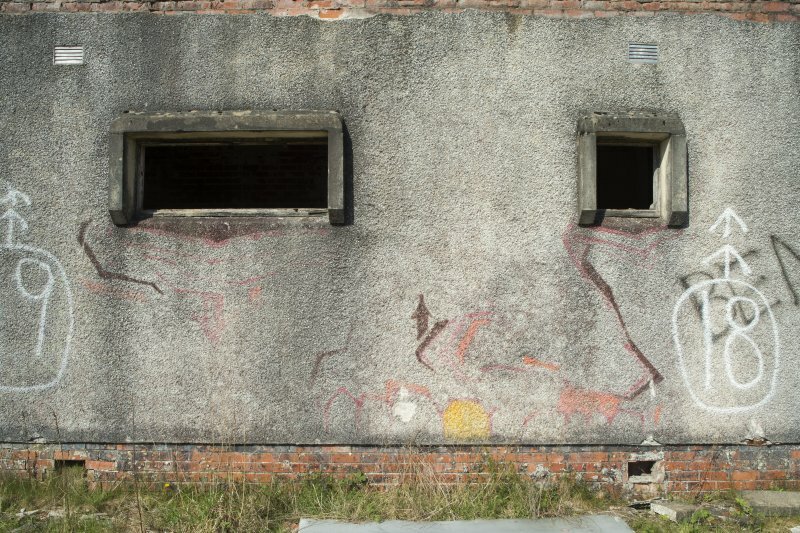 Graffiti art on exterior wal of laundry block, taken from the north. 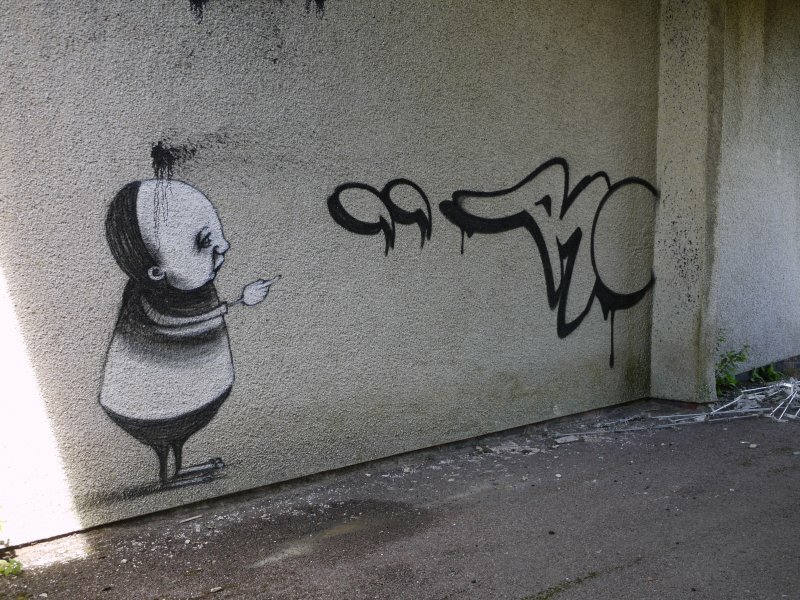 Graffiti art tag by Smug. General view of Pollphail village, taken from the south-east. 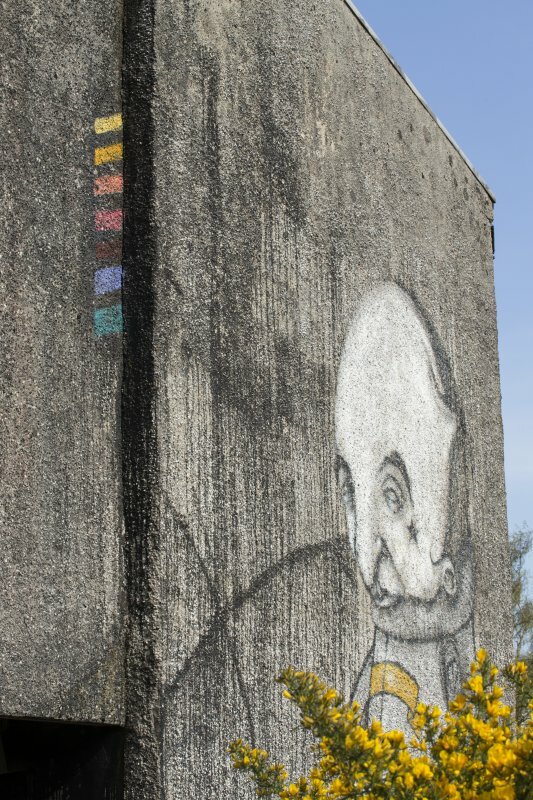 Detail view of graffiti art by Stormie Mills, taken from the east. 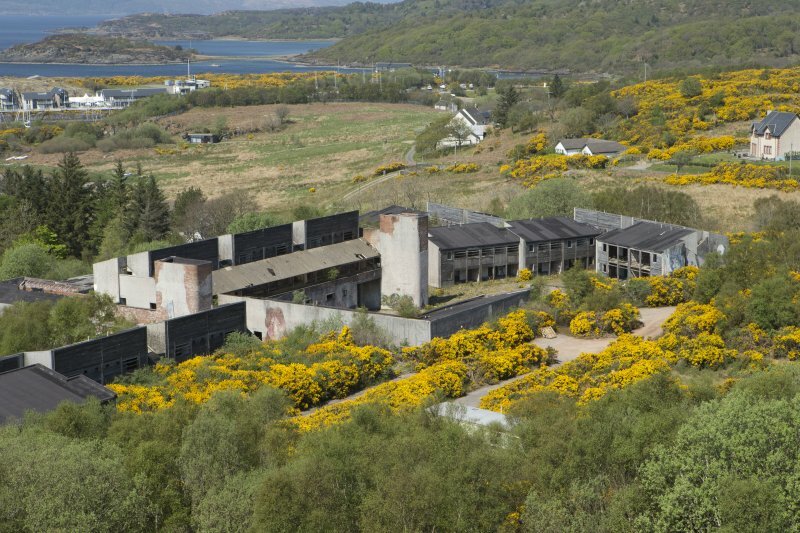 General view of accommodation blocks, taken from the west. General view of accommodation block, taken from the west. 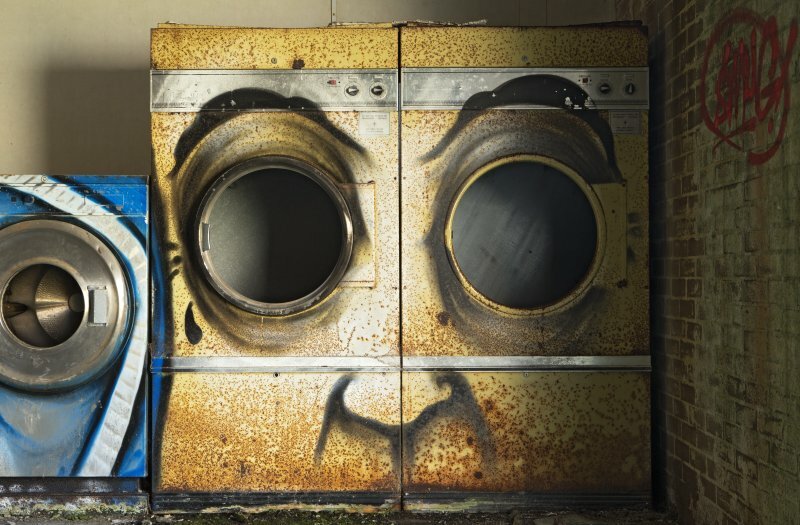 Detail of washing machine and tumble drier, painted by Stormie Mills and System, members of Agents of Change. General oblique aerial view centred on the marina, taken from the SSE. View of one of Stormie Mill's figures. 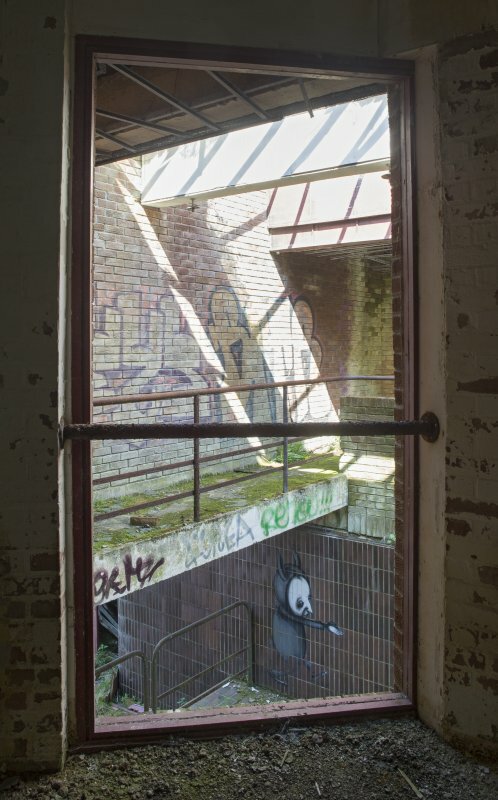 View of main stairwell with multiple graffiti images. General view of two of Stormie Mill's figures, taken from the north. Central block. View from south west. Central block. First floor. 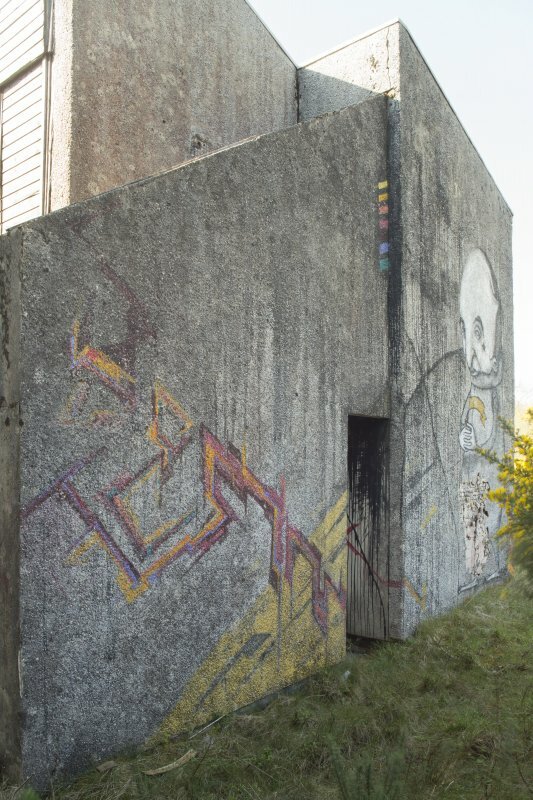 View of graffiti by Stormie Mills from south. Accommodation block. 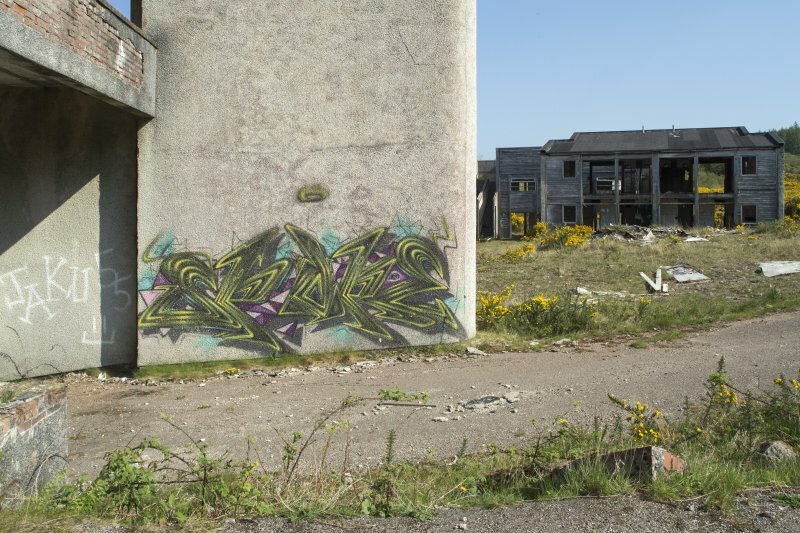 View of graffiti art by Derm and Stormie Mills from south east. Central block. Detail of graffiti art by Juice 126. Central block. View from east. Central block. View from north west. Central block. View of graffiti art by System from south. Central block. View of graffiti art from east. Central block. 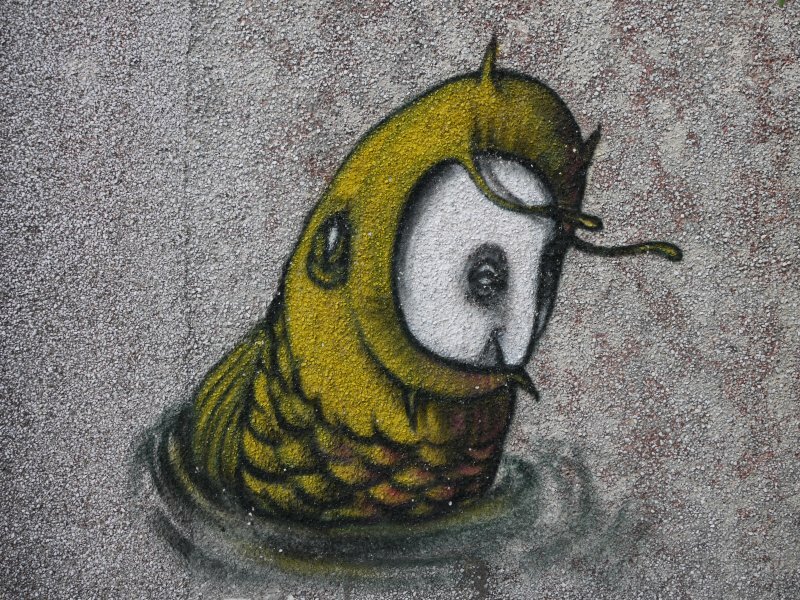 Detail of graffiti art by Spore. Central block. 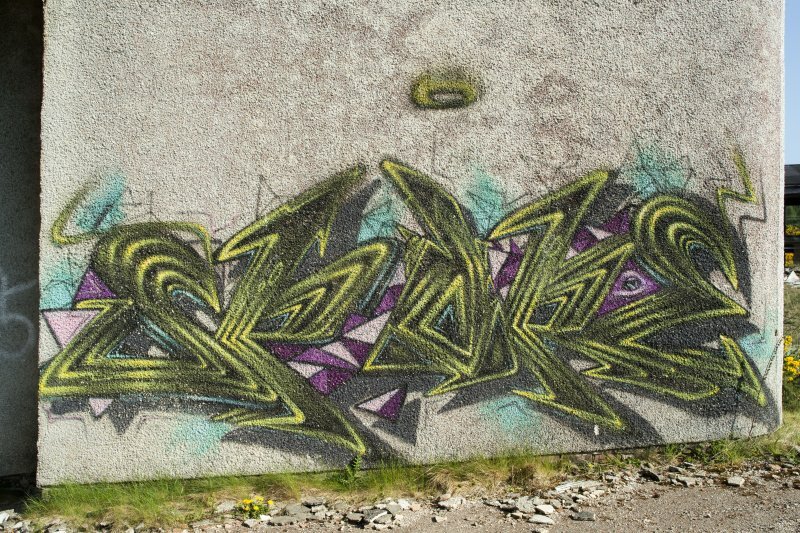 View of graffiti art by Spore from south. Laundry block. 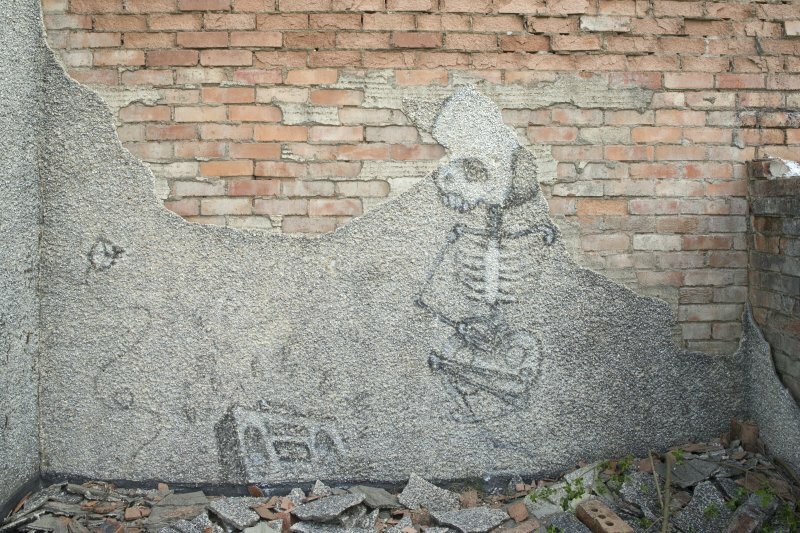 Detail of graffiti art. Laundry Block. View from south west. Central block. 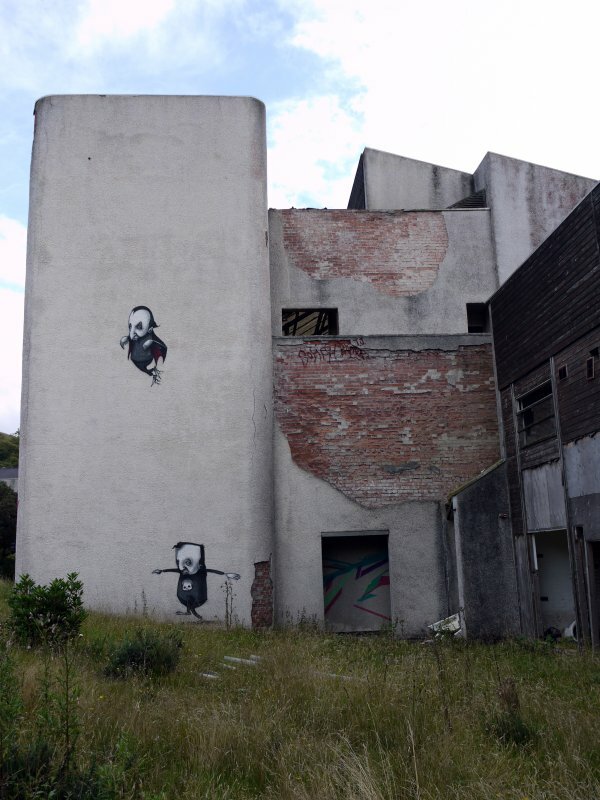 View of graffiti art by Timid from north. Central block. 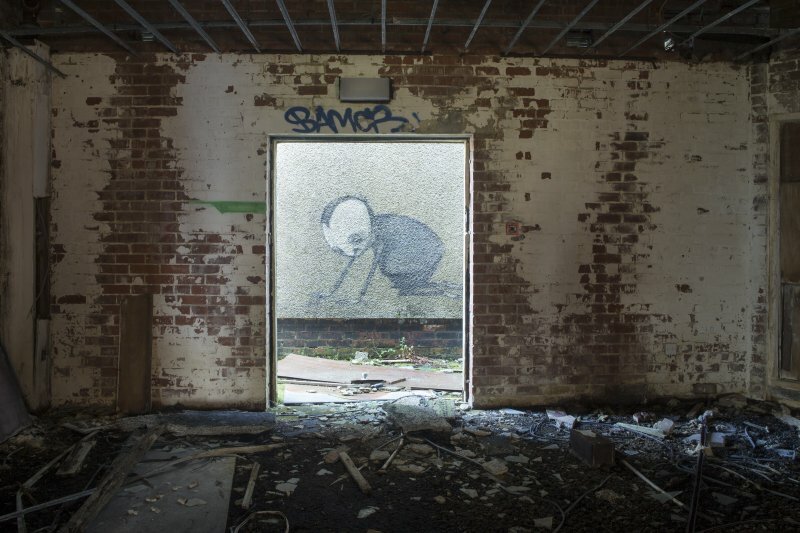 View of graffiti art by Timid from north west. Central block. View of graffiti art by Derm from north. Central block. 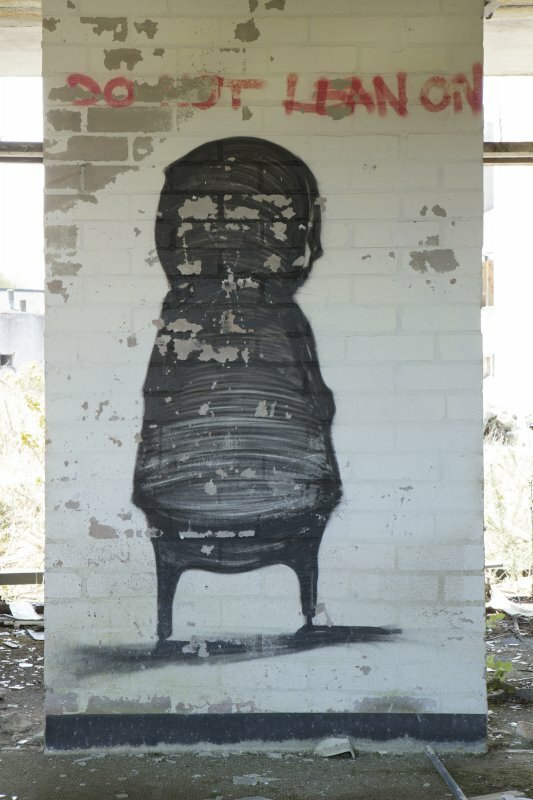 View of graffiti art by Stormie Mills and Derm from north west. Laundry block. Detail of graffiti art by Derm. 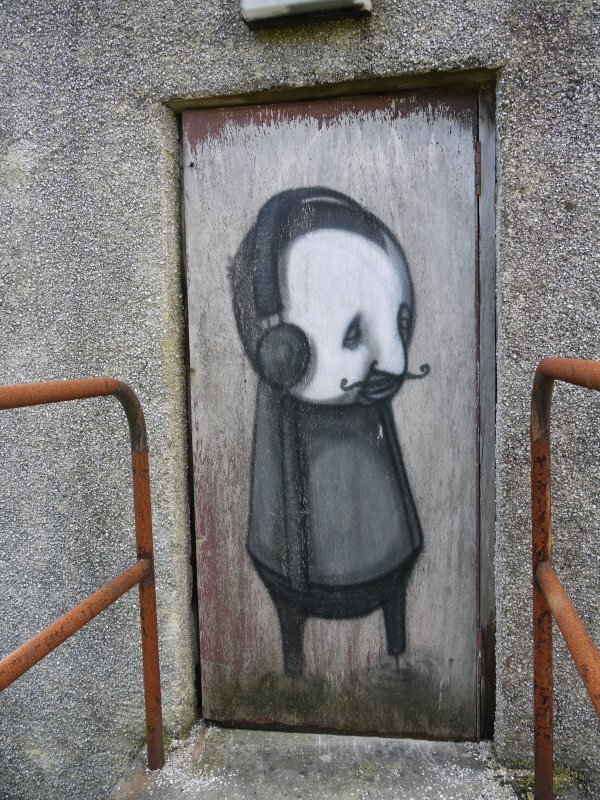 Detail of graffiti art by Timid, in doorway of northern acommodation block, taken from the south. View between two accommodation blocks, taken from the east. 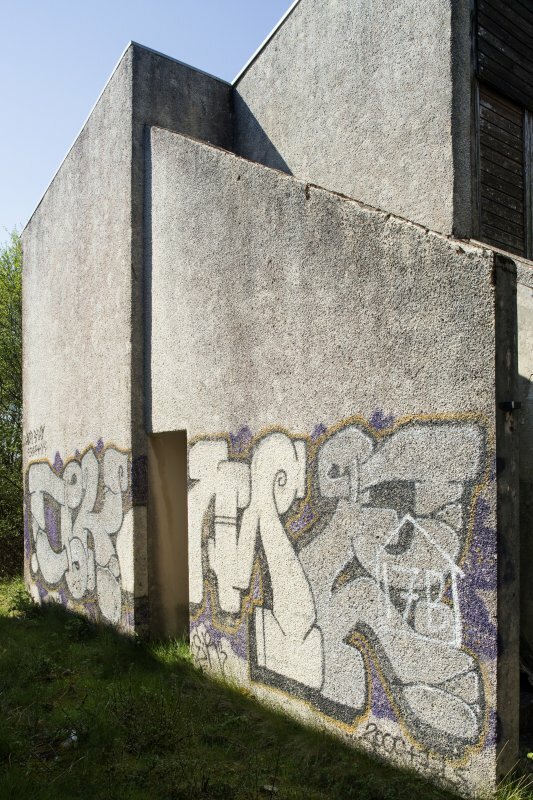 Detail view of graffiti art by Derm and Stormie Mills on gable end of accommodation block, taken from the south. View of Stormie Mills character, located in the northern accommodation block, taken from the north. Detail of Stormie Mills character. General view of accommodation block, taken from the south-west. 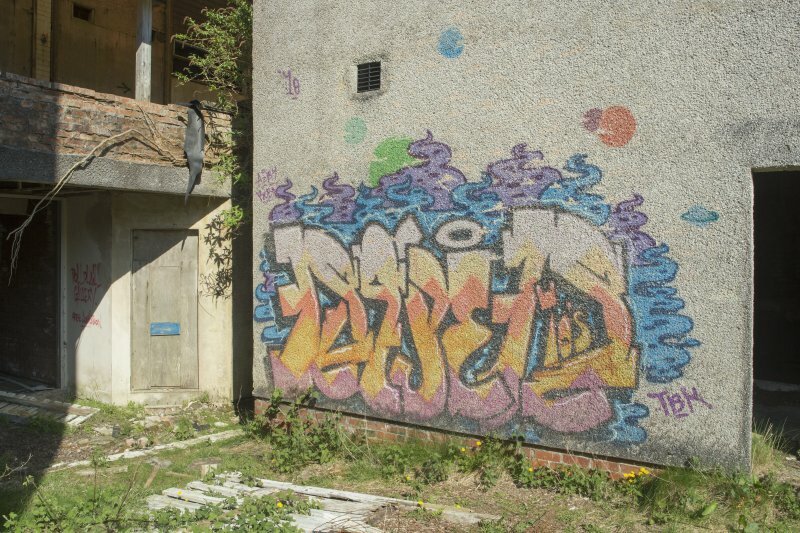 View of graffiti art on laundry block, taken from the north. 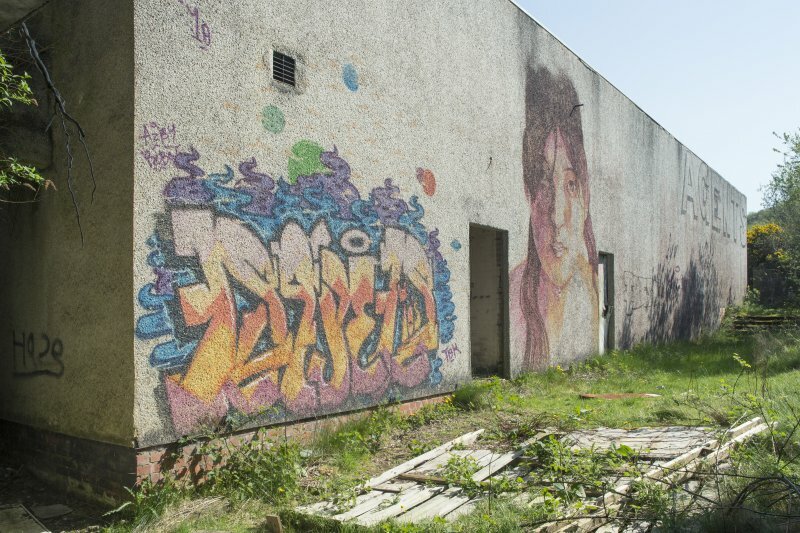 General view of graffiti art on central block, taken from the east. 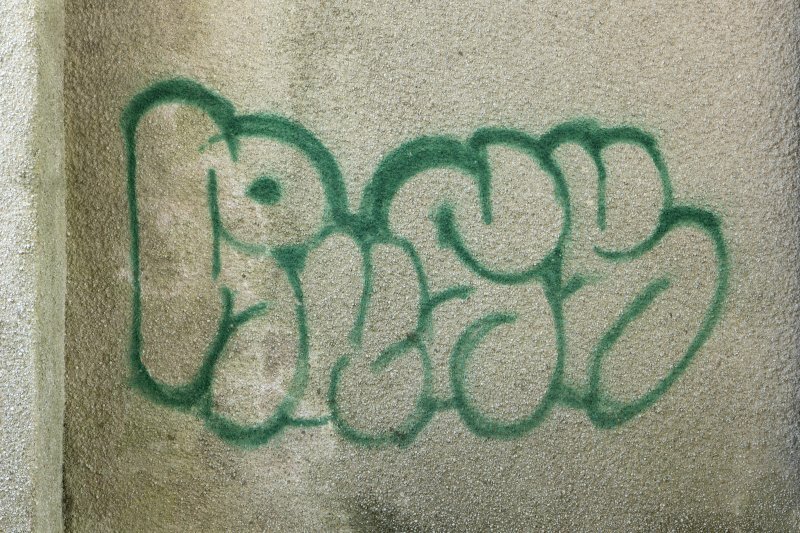 Detail view of throw-up graffiti, taken from the south. 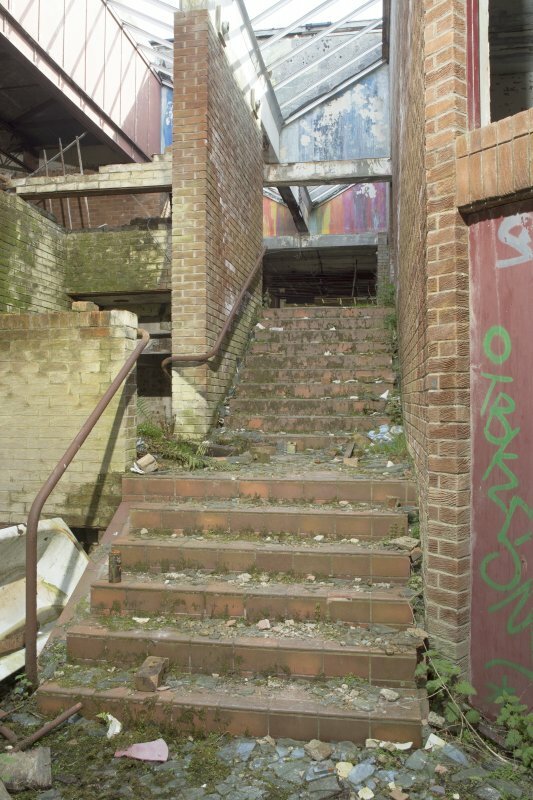 General view of main stairwell with multiple graffiti images. 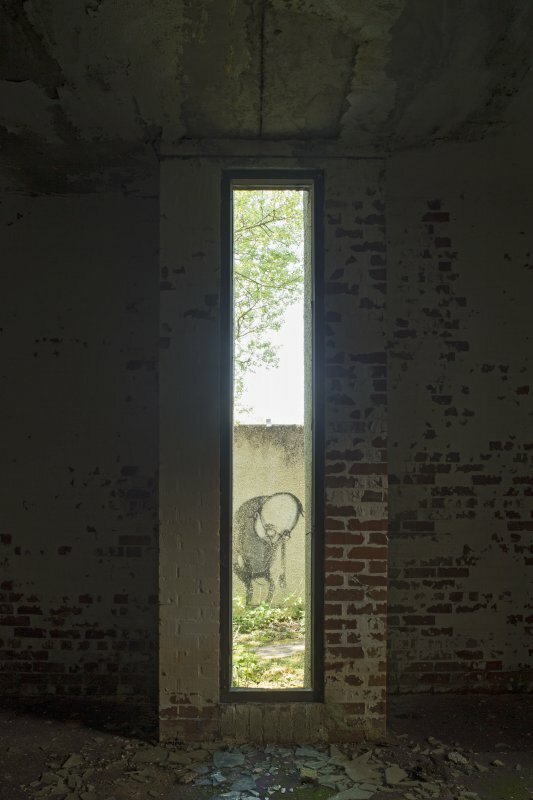 View of one of Stormie Mill's figures on an exterior fire door. 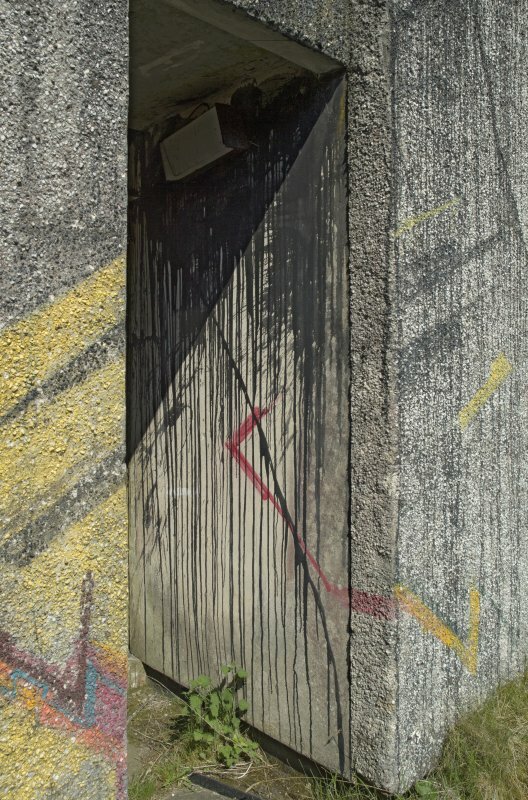 Detail of graffiti art by System, with latitude and longitude details. Taken from the west. 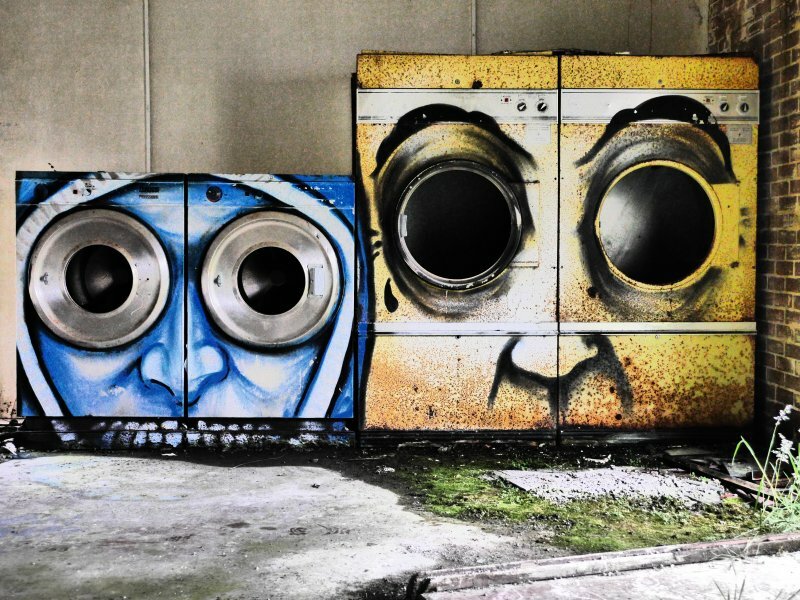 Laundry block. 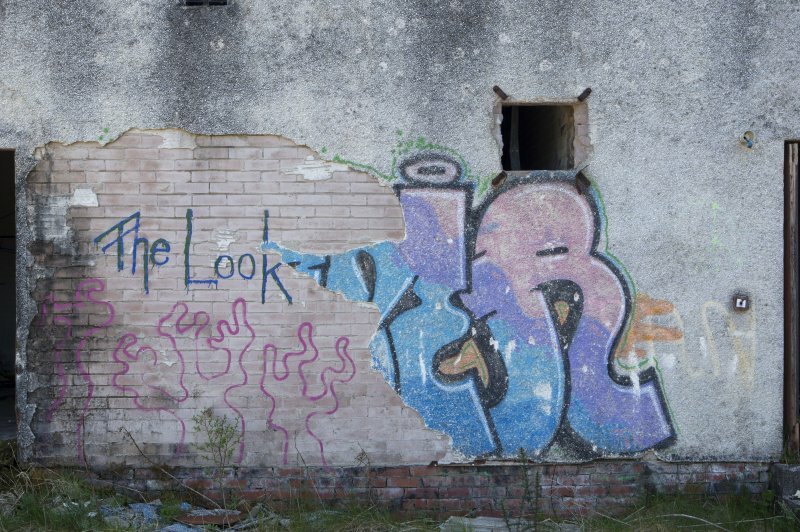 View of graffiti art from north west. Accommodation block. View of graffiti art by Stormie Mills from north. Central block. View from south east. Central block. 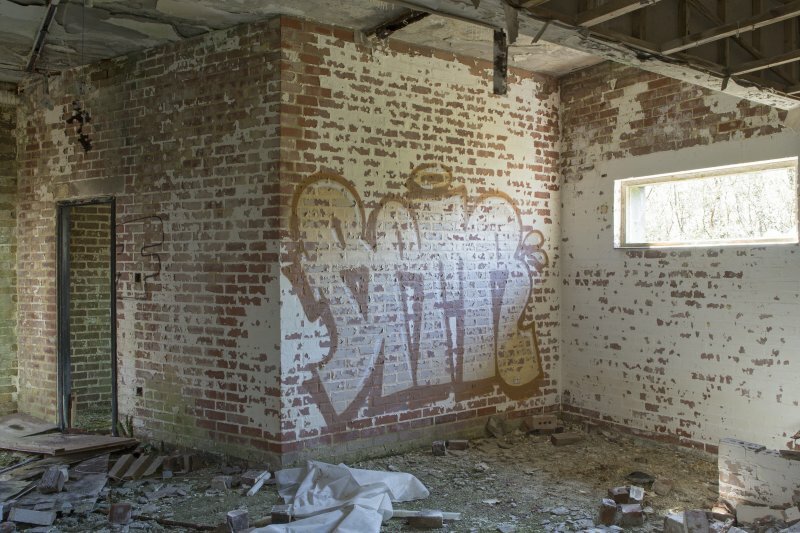 View of graffiti art by Derm from south east. Central block. 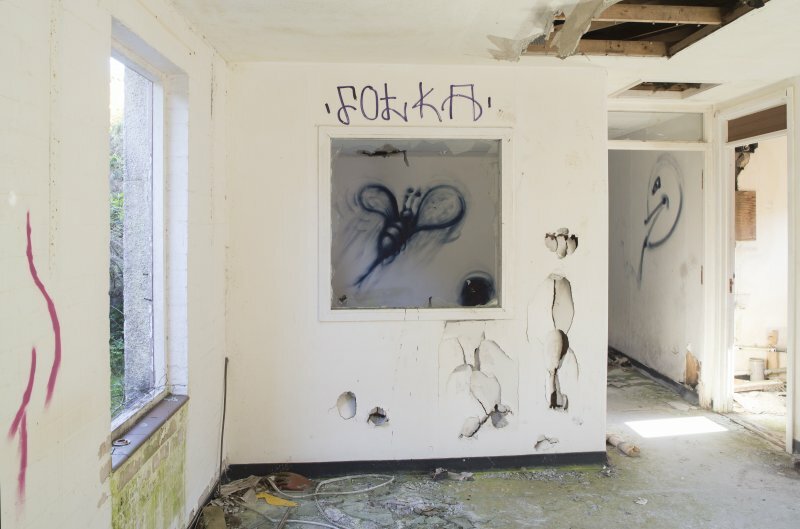 View of graffiti art by Derm from north west. 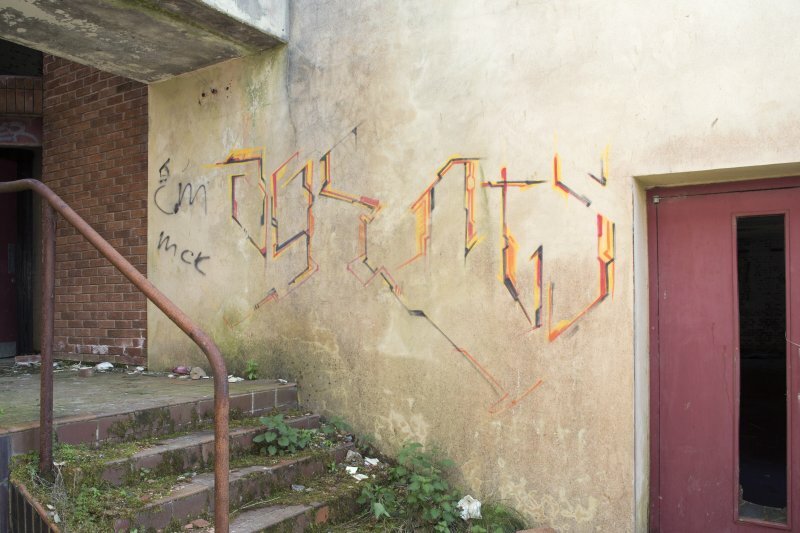 View of graffiti art, possbly by Stormie Mills. View of main block, taken from the east. 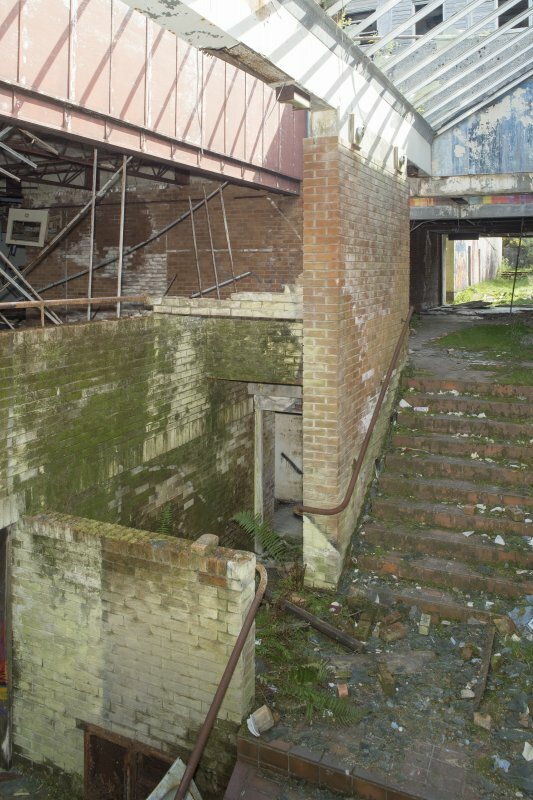 General view of main block stair tower, taken from the east. 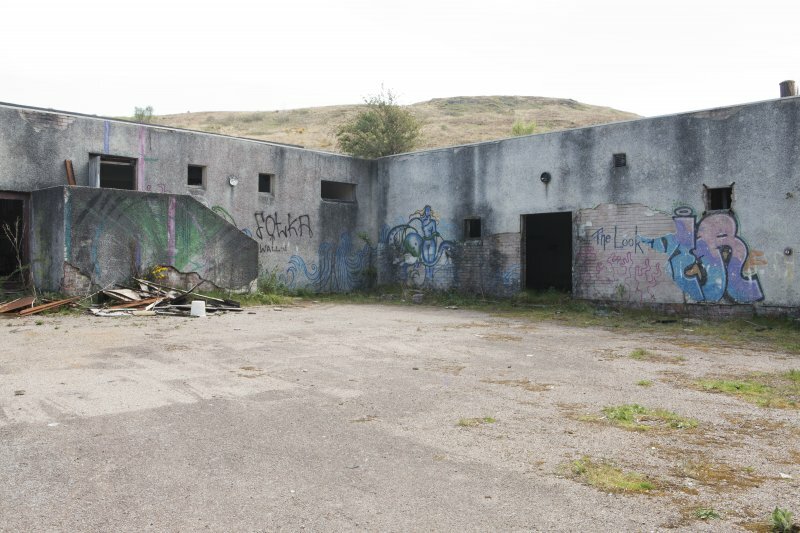 General view of main block at Pollphail, taken from the north-east. 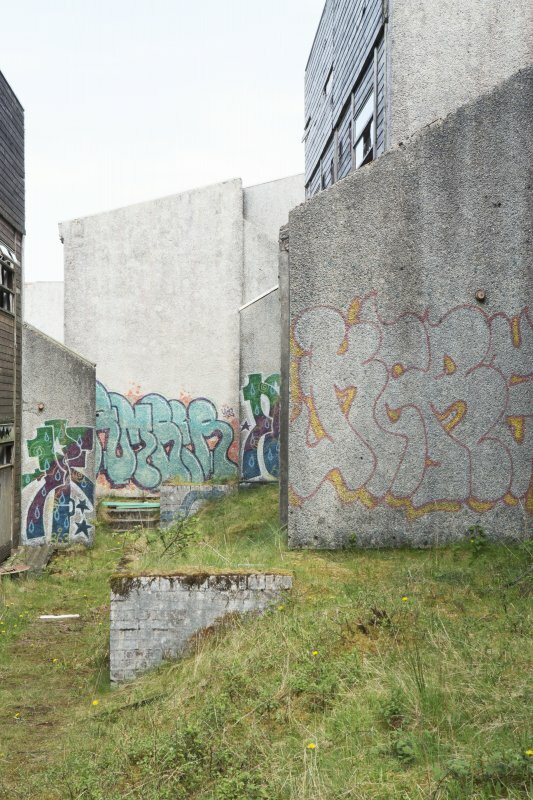 View of graffiti art by Timid, on northern accomodation block. 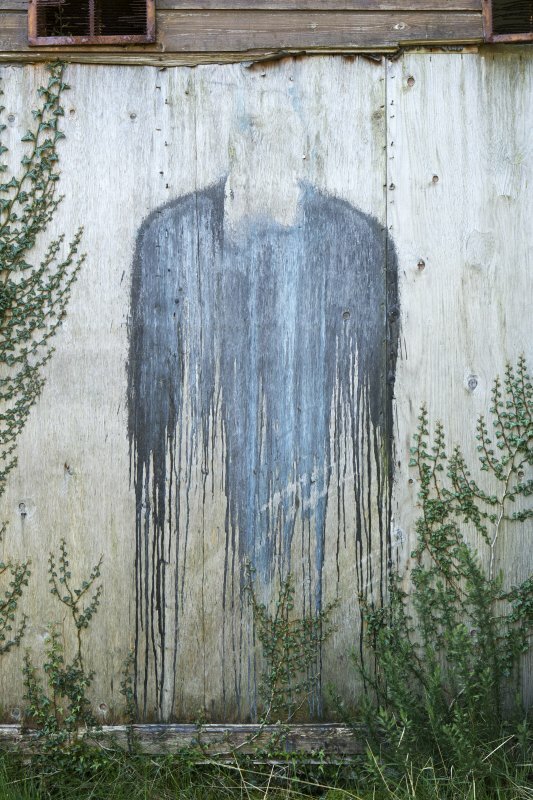 Detail of Stormie Mills character and later writing, taken from the south. General view of northern accommodation blocks, taken from the east. 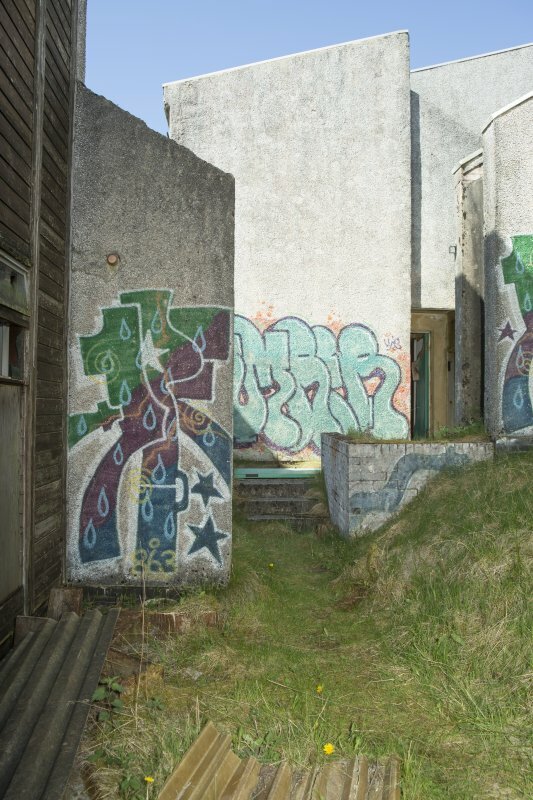 View of graffiti art by Derm, Timid and Stormie Mills on gable end of accommodation block, taken from the east. 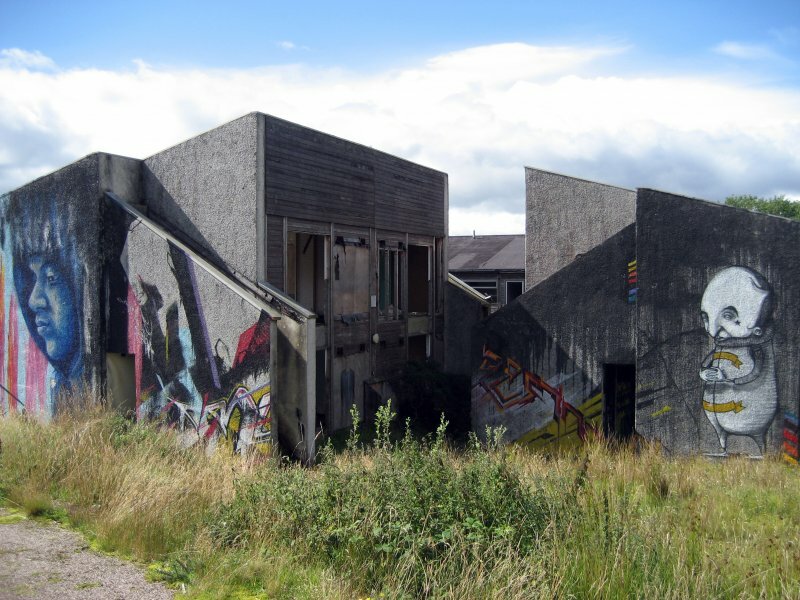 View of accommodation block and graffiti art, taken from the west. 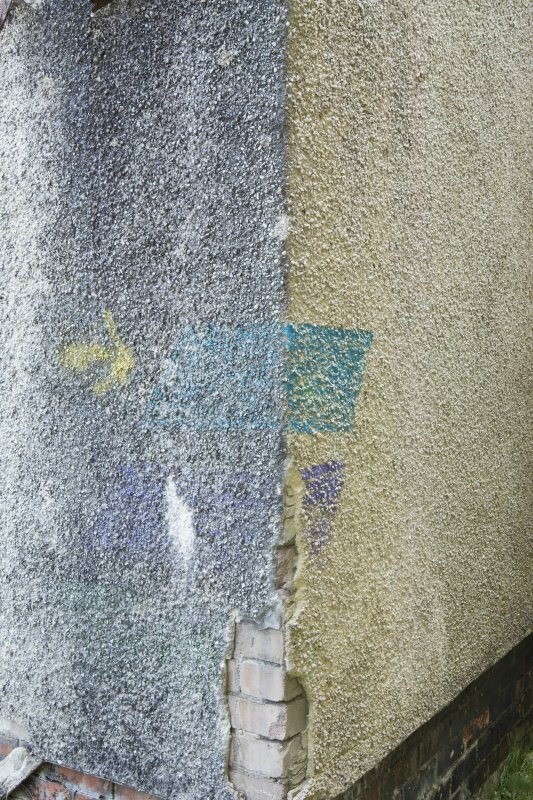 Detail view of graffiti throw-up. 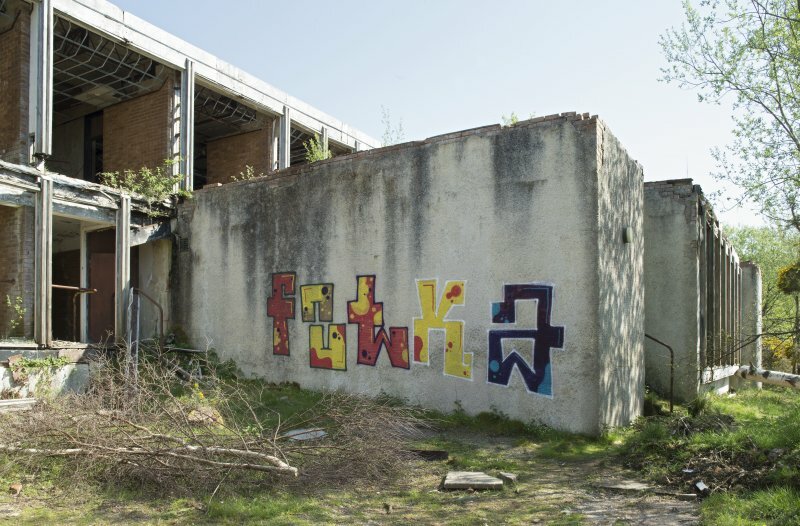 General view of central block and graffiti, taken from the north-west. General view of composite image by Agents of Change: Derm, RemiRough, Juice 126, Jason System, Timid and Stormie Mills. 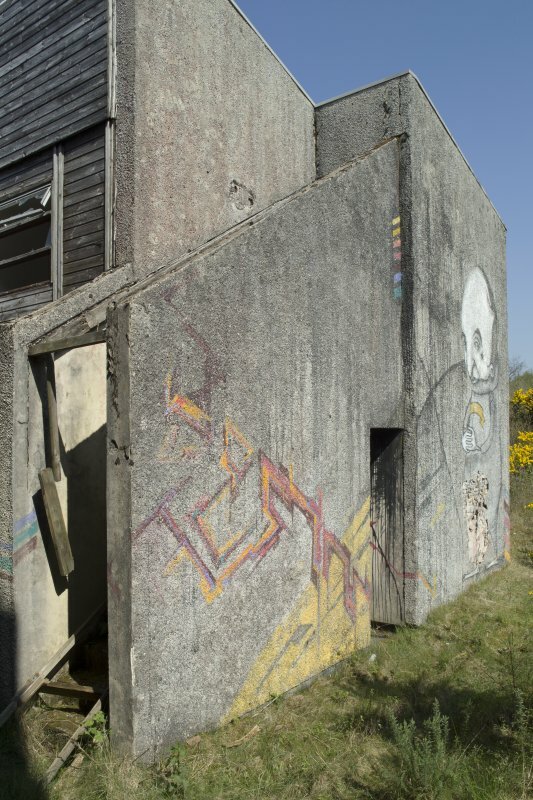 General view of the collaborative graffiti art at Pollphail village, taken from the east. Central block. View of graffiti art by Derm from north east. Accommodation block. 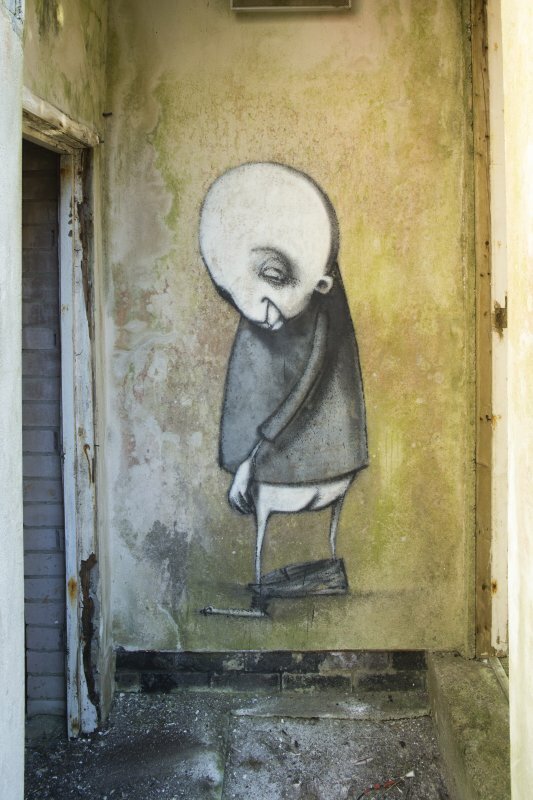 Detail of graffiti art by Stormie Mills. 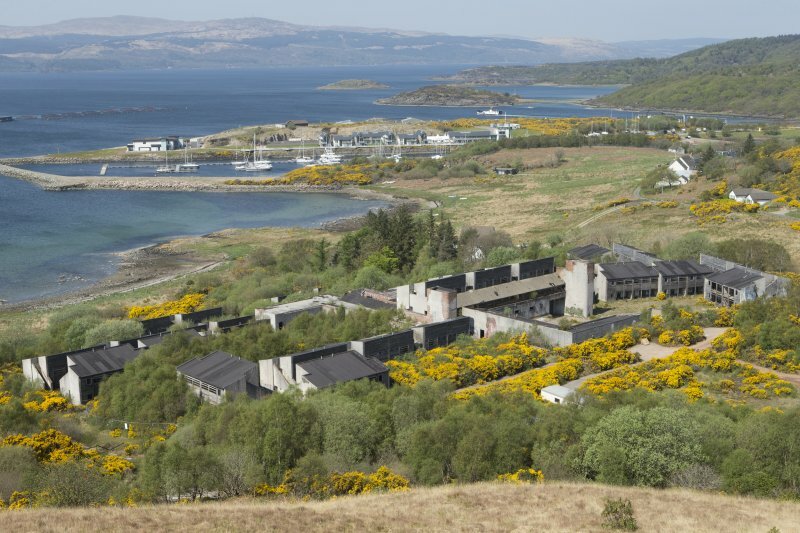 The ruins of Pollphail industrial village are situated on the east shore of Loch Fyne, 570m south-east of Portavadie marina (Canmore ID 288014). 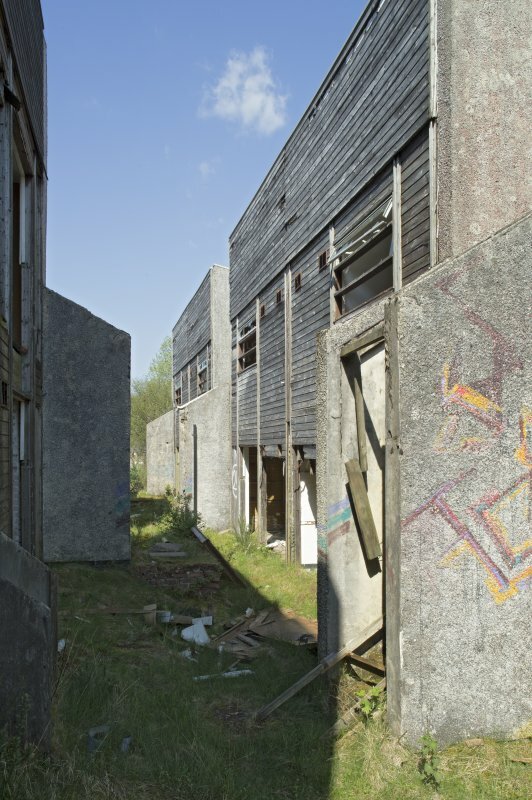 The village was designed by Thomas Smith, Gibb and Pate architects and has been subsequently described as being ‘sadder than a deserted holiday camp’ (Walker 2000, 432). 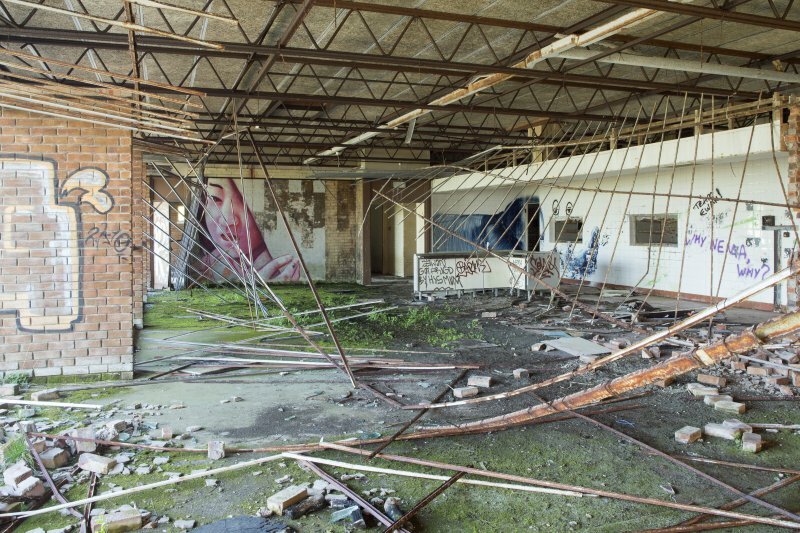 It was built between 1975 and 1977 in order to house workers for an oil platform construction yard, but it was never occupied and began its decline into ruin shortly after completion. 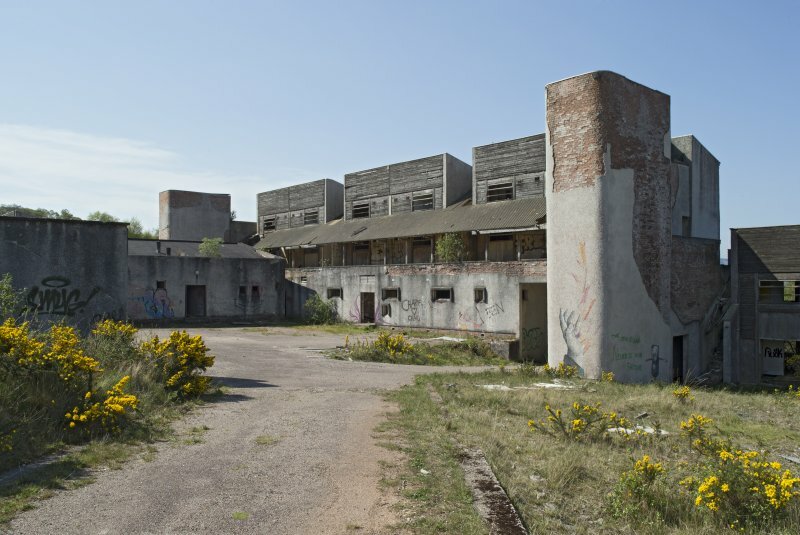 It comprises a central three-storey building; a single storey, L-shaped laundry and services building; and 19 outlying accommodation blocks. 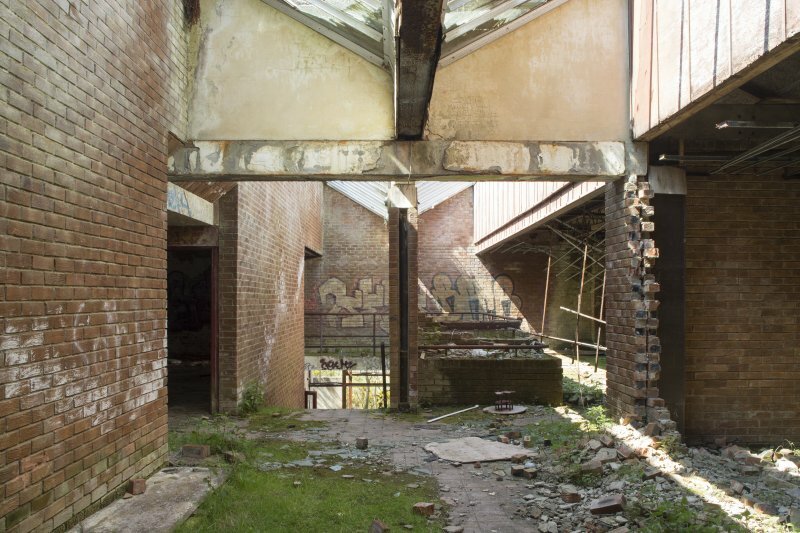 The central buildings are arranged around a courtyard and provide space over the basement and ground floors- for catering facilities, recreation rooms and administrative offices. 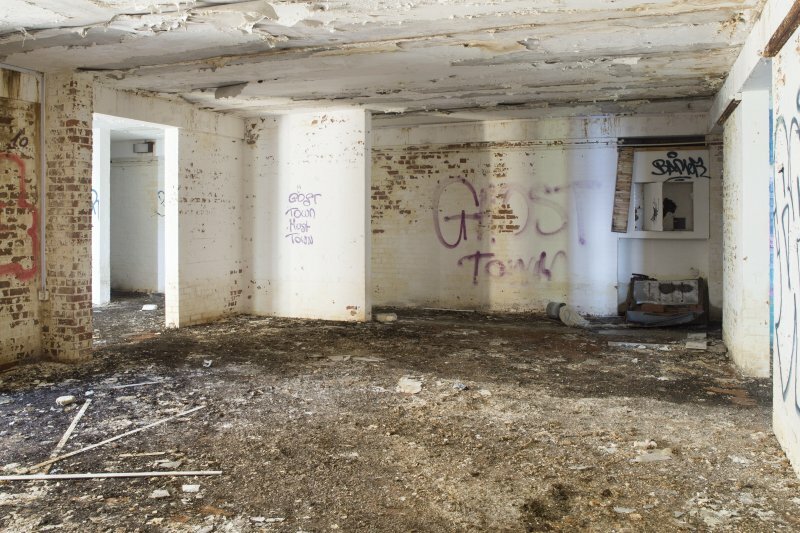 A second floor comprises accommodation for staff. The 19 accommodation blocks are arranged in an arc, from the north through west to the south-east of the central building. 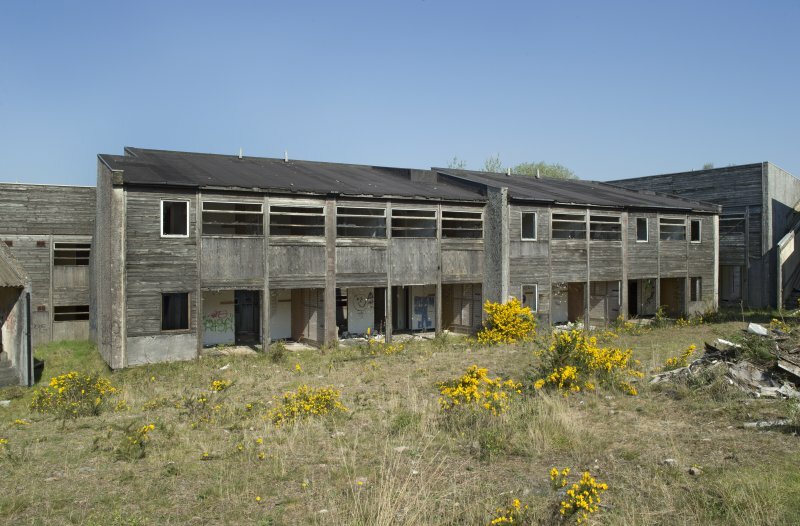 The two-storey accommodation blocks are built to a unitary standard and comprise single blocks or up to three conjoined. 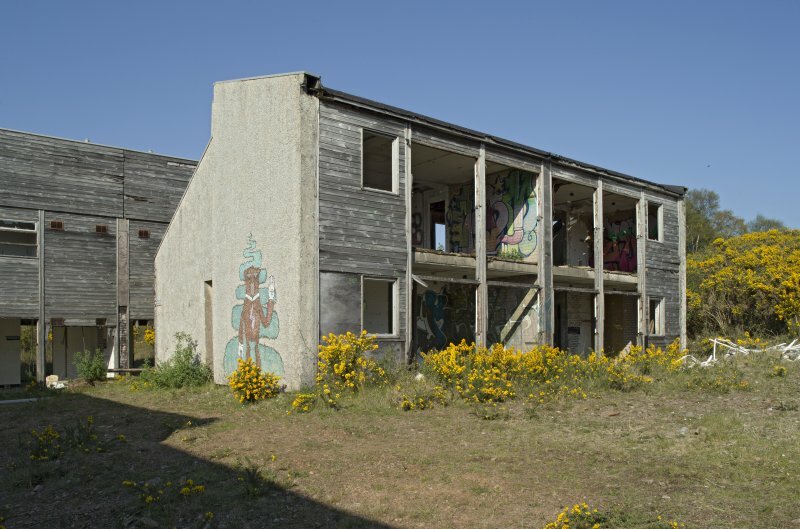 A stand alone accommodation block at the extreme north-east end of the site was surveyed in detail and the following account describes the specific components. The building is rectangular on plan measuring 13.3m from E to W by 7.5m transversely. 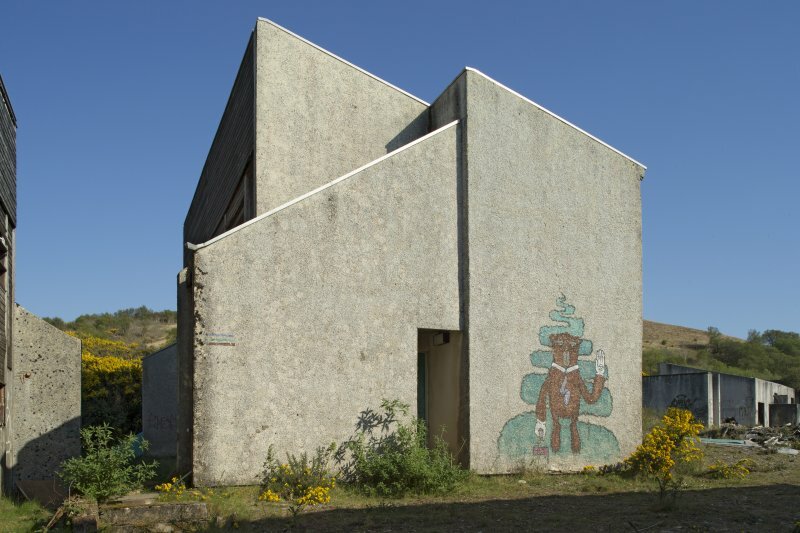 It comprises a mono-pitch roof, rendered concrete gables, and slab floors. 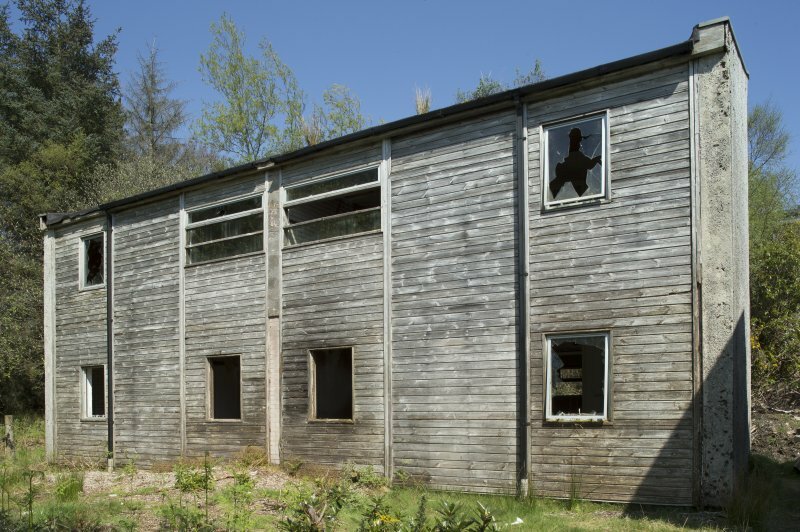 The external side-walls are timber framed and, where surviving, clad in horizontal timber boards. 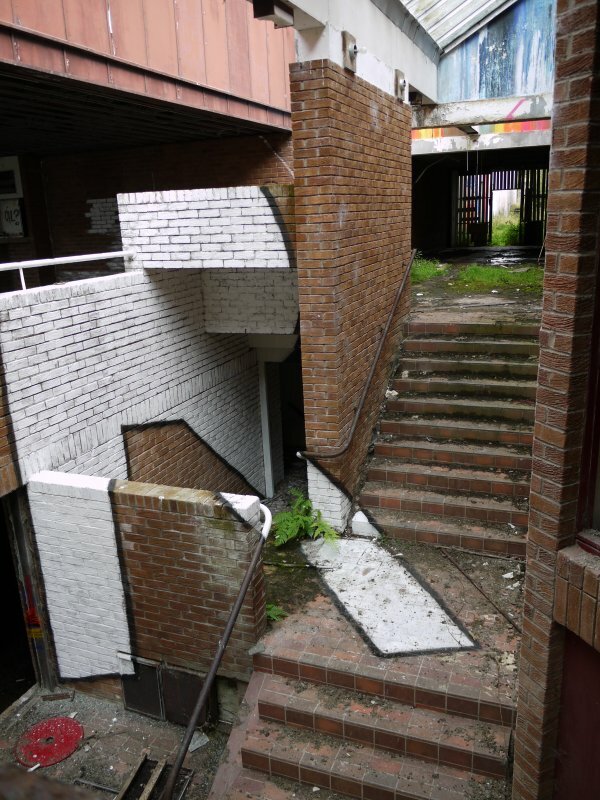 Each unit incorporates partially covered stairways at either end. 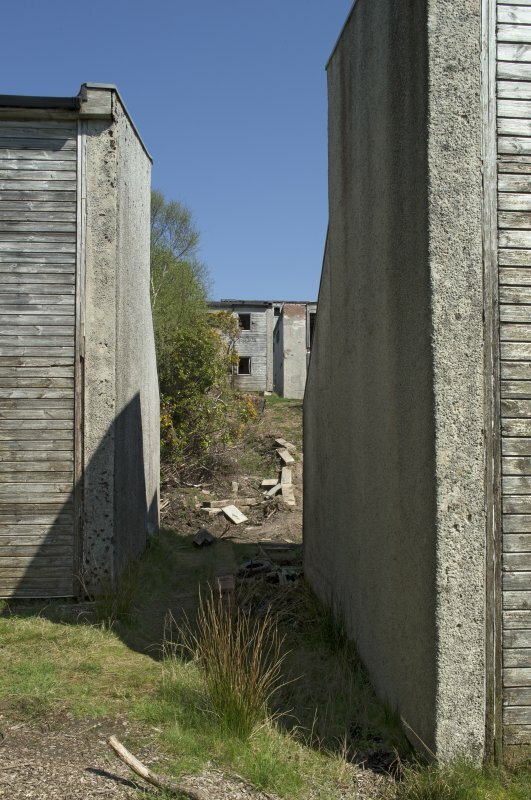 The interior of the building is subdivided into two equal portions by a full height, mid-point concrete wall. 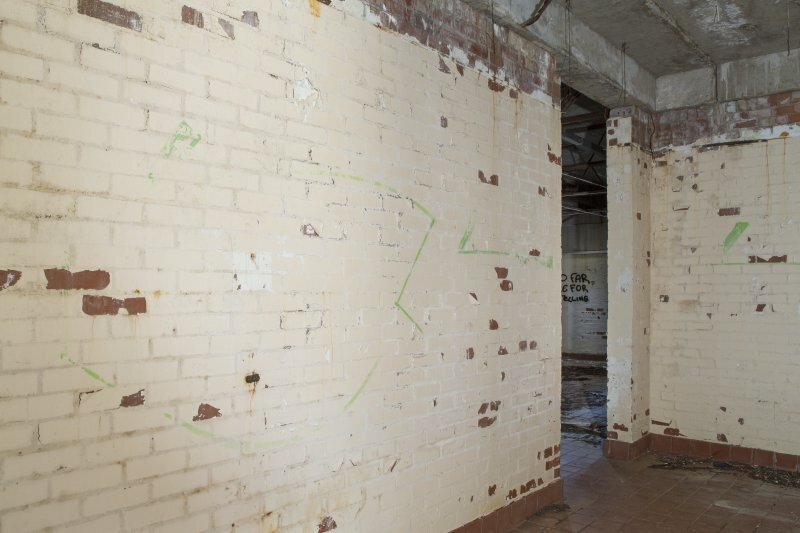 Other internal partitions include brick walls and plasterboard divisions, although on the date of visit only two of the free-standing, brick walls remained and these appeared not to be pinned to the roof. 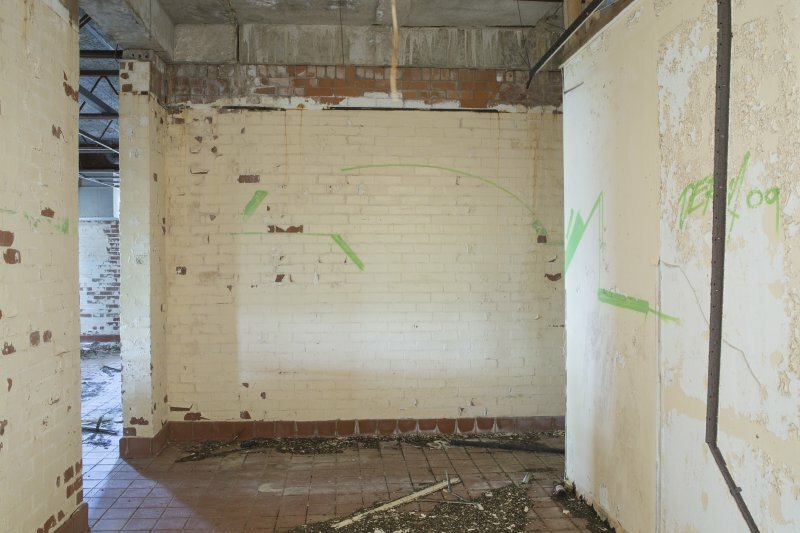 The building is subdivided to provide a bathroom/toilet facility on each floor and 16 individual bedrooms in total, with storage space under the stairs. Overall, the accommodation, based on this design, could have provided space for over 400 individuals. 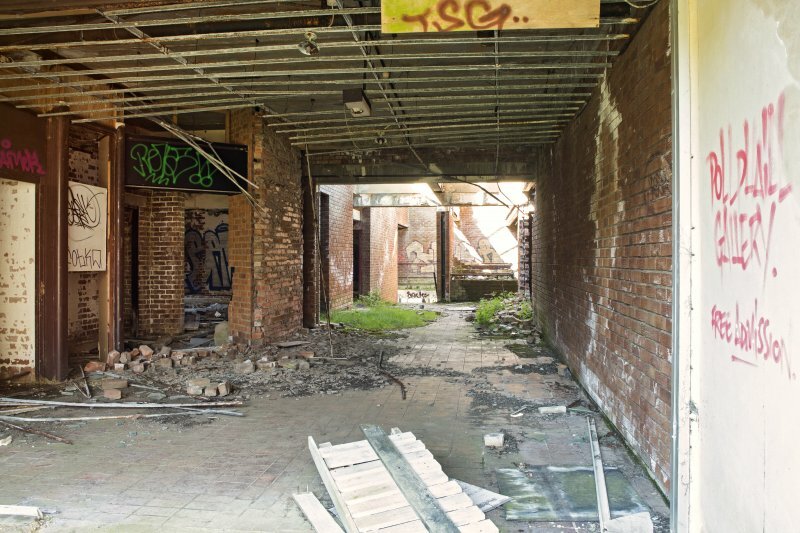 On the date of visit, the remains of all of the buildings, although roofed, were in a ruinous state. 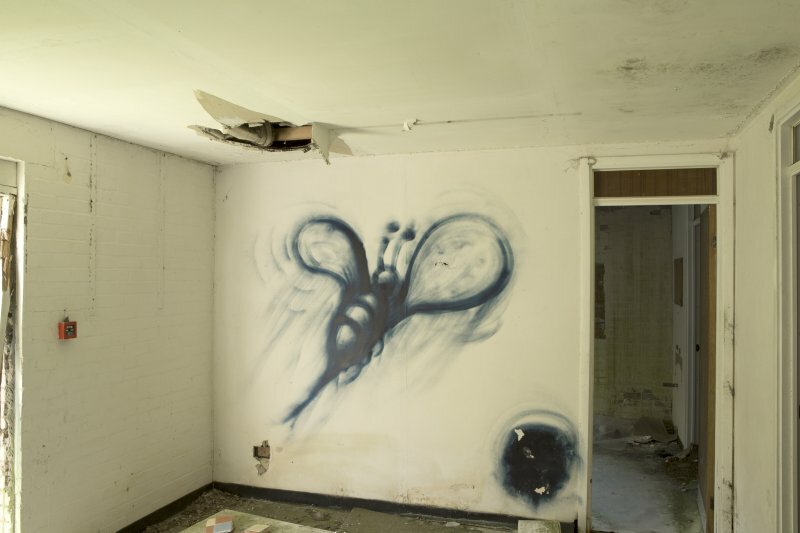 In 2009, a collective of six artists, Agents of Change, used the village as the canvas for their creative work. 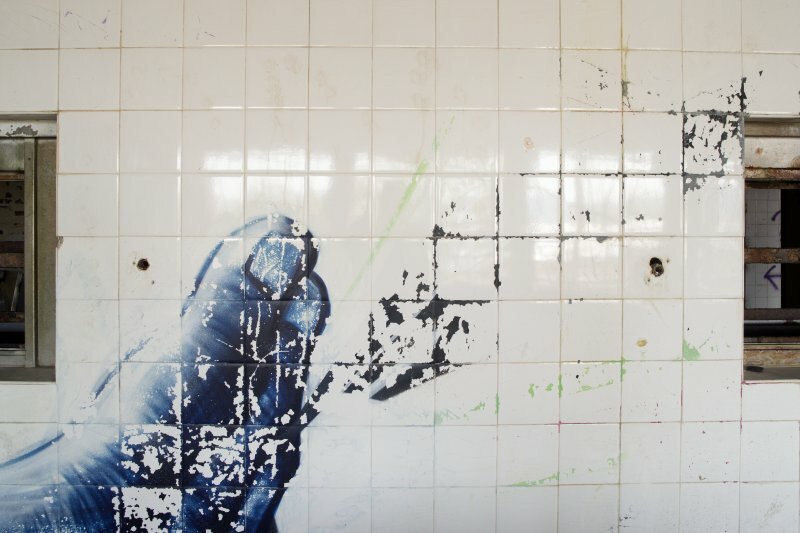 The artists in Agents of Change who worked at Pollphail were Stormie Mills, System, Derm, Remi/Rough, Timid and Juice 126. 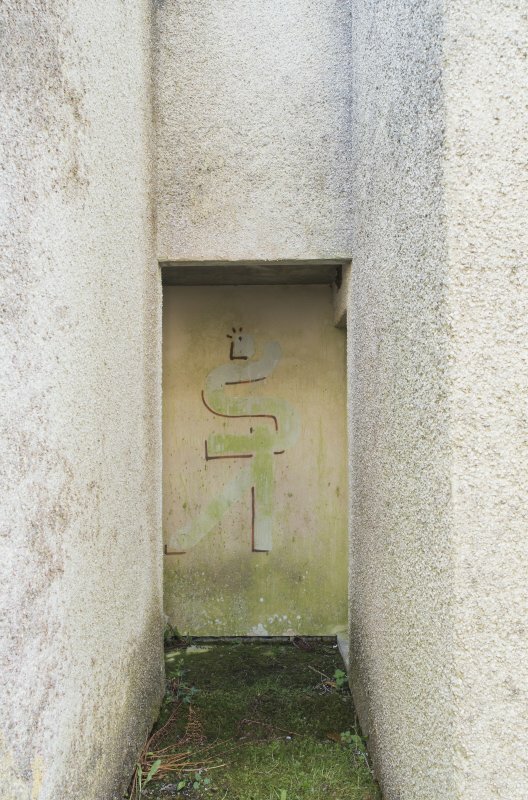 Agents of Change are globally recognised artists and their intervention at Pollphail altered the significance of the village. 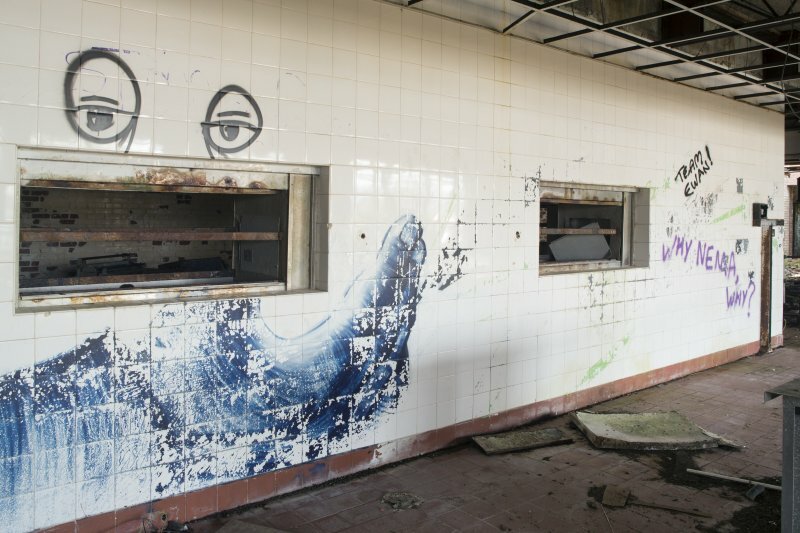 Over the course of a number of days they created over 75 individual and composite pieces of art, using the surfaces that the abandoned buildings, external and internal walls, and fittings presented. 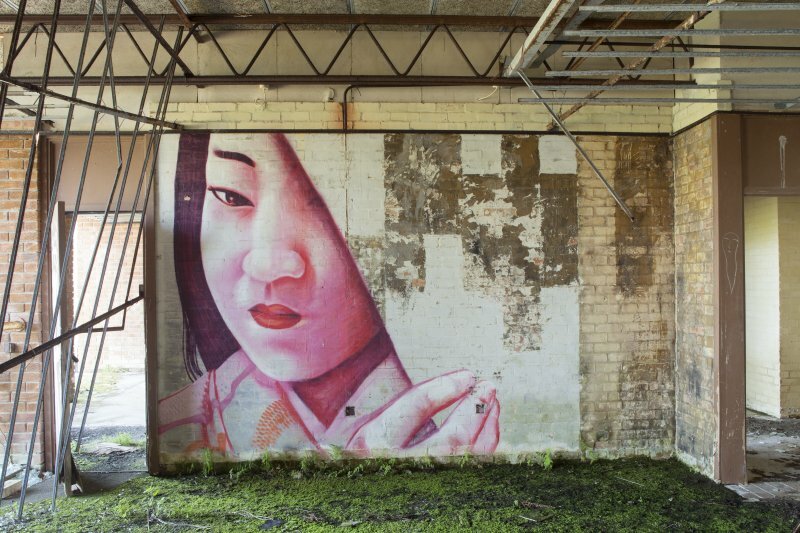 The works ranged from at least 16 haunting figurines in various locations by Stormie Mills to large-scale representations of individuals, such as the actor Kelly MacDonald by System. 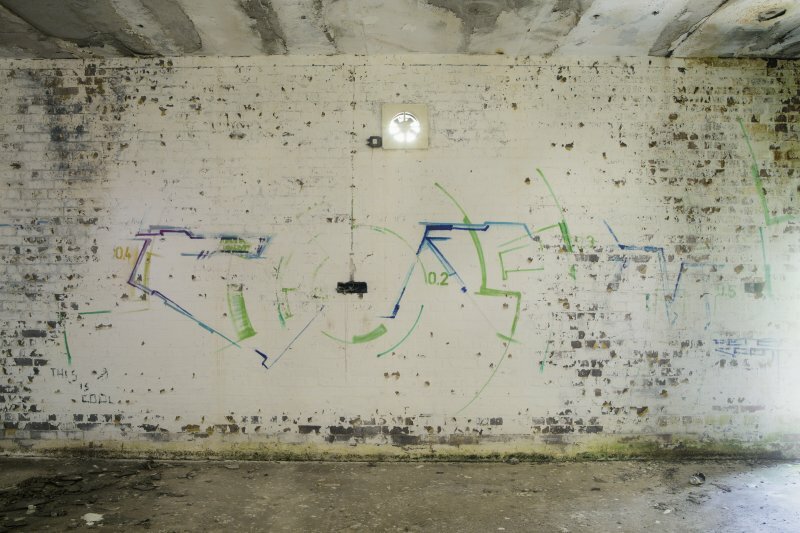 The works also included linear constructions of text by Derm, abstract forms and text by Remi/Rough, somewhat sinister drip forms by Timid, and bright splashes of colour by Juice 126. 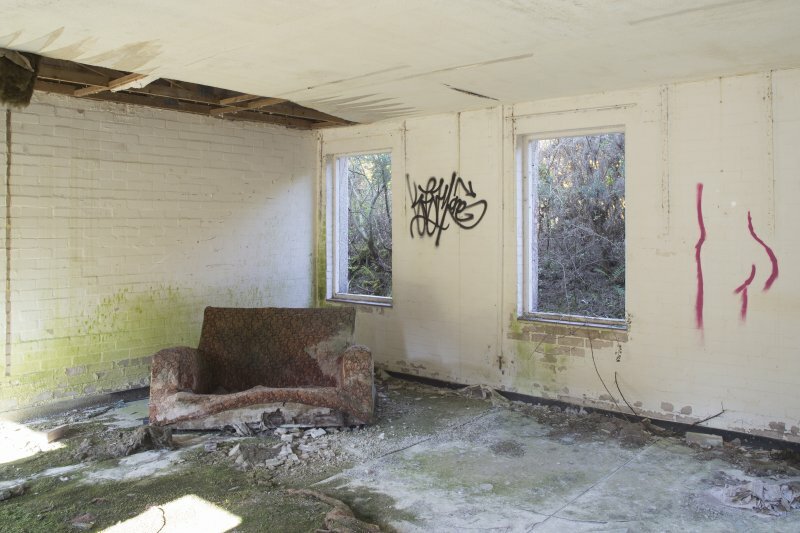 They made a short video of their intervention, entitled ‘Ghost Village’, (http://agents-of-change.co.uk/films/). 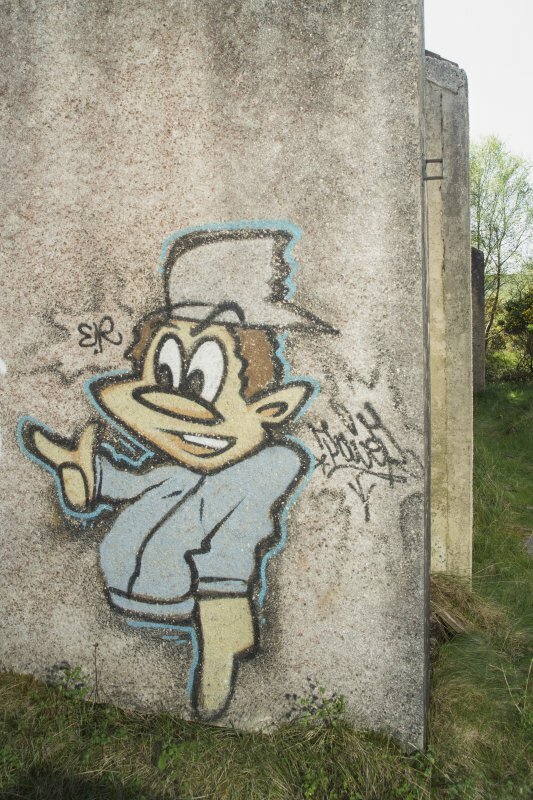 Partially as a result of the artists’ work, the village has seen an increase in the number of visitors, and additional graffiti art has been created. 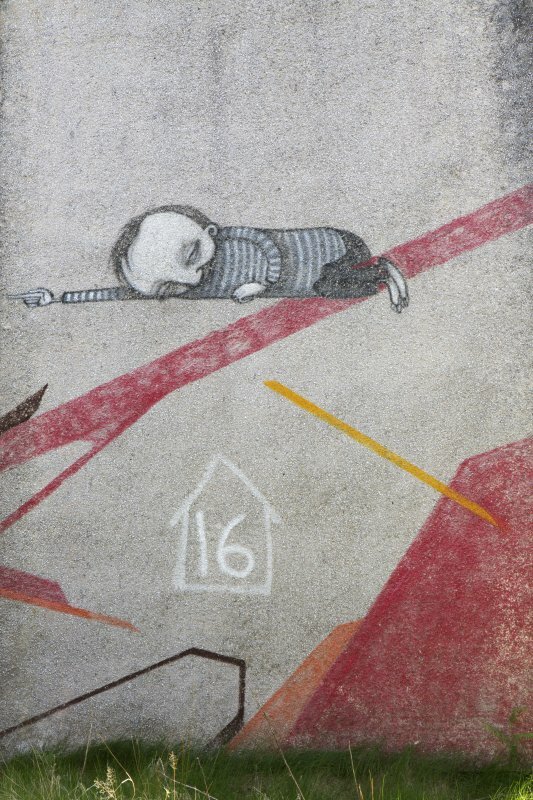 These more recent pieces appear to respect and complement the existing works. 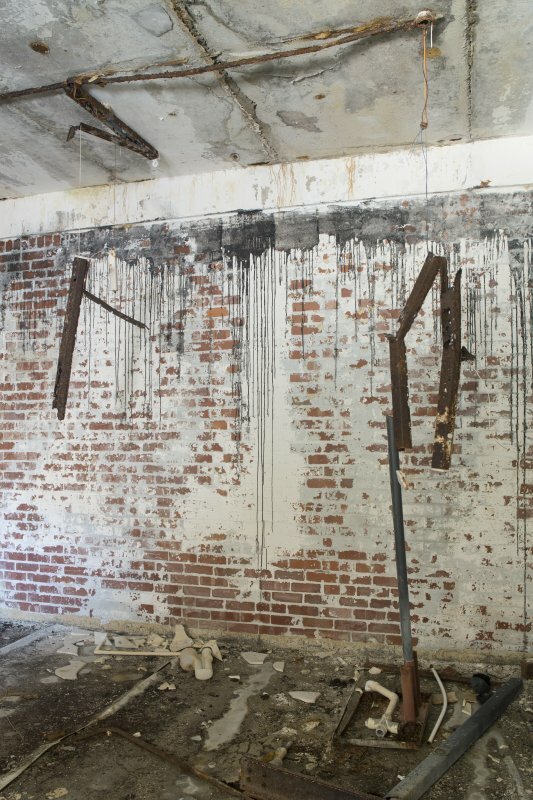 In the case of one example where the original wall render that had been painted had fallen off, Smug has put a piece on the exposed brick wall. 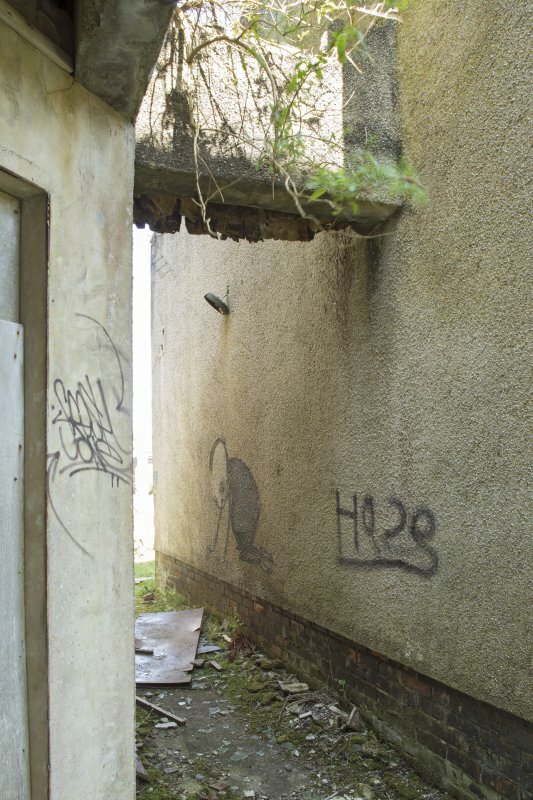 On the dates of visit a comprehensive photographic record and a number of site plans were undertaken to record the graffiti art and the buildings. 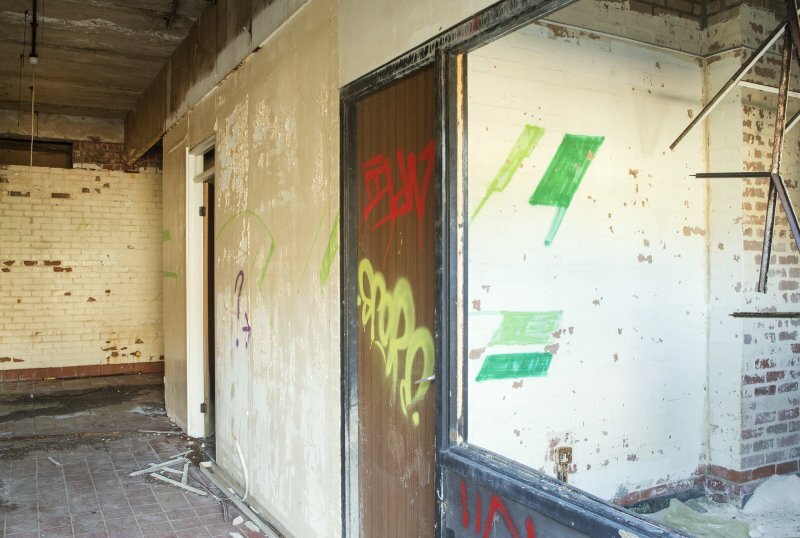 The village was demolished in November 2016, as part of a redevelopment scheme. Visited by HES (AGCH, ZB, SW) 9-11 May 2016. Economic boom times can lead to some extraordinary decisions being taken. 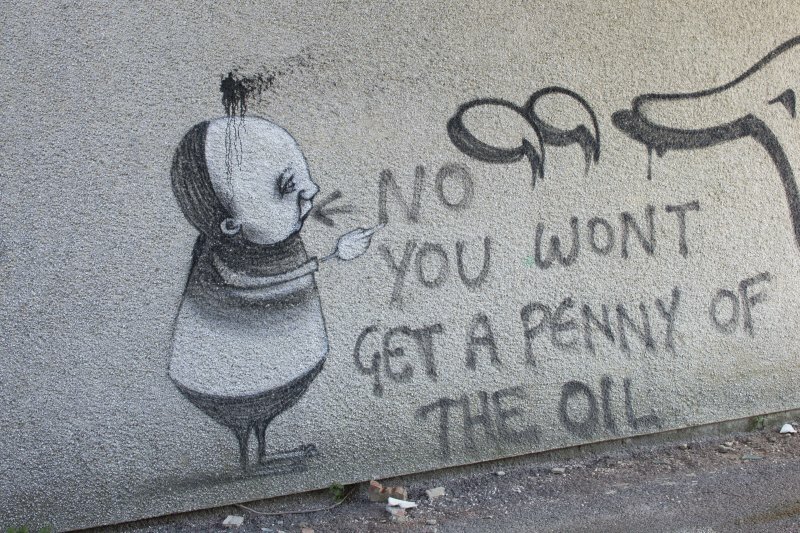 The story of Pollphail is one such story. The location was chosen for the site of a fabrication yard that would turn out oil platforms. 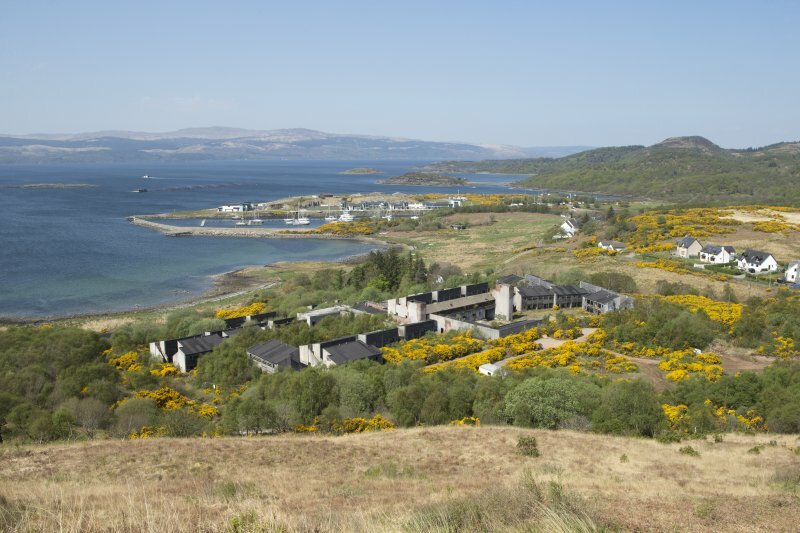 This meant a large workforce needed housing and there was a sparse population on this part of the Cowal peninsular in Argyll, at the time. 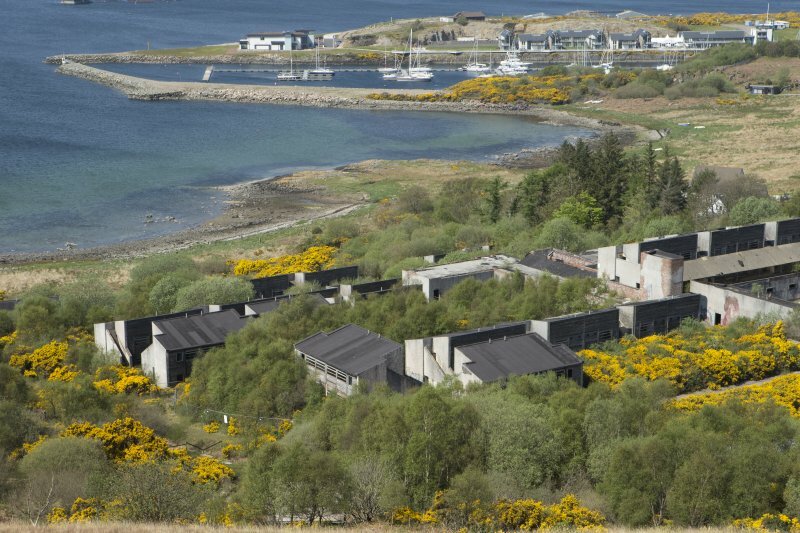 To alleviate the lack of accommodation a workers village was designed by Thomas Smith, Gibb and Pate Architects. 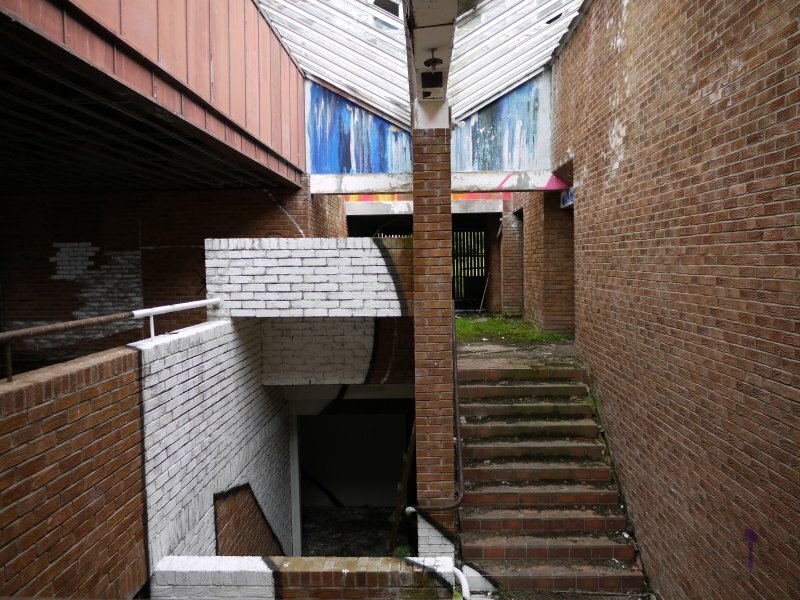 The village was built between 1975 and 1977. 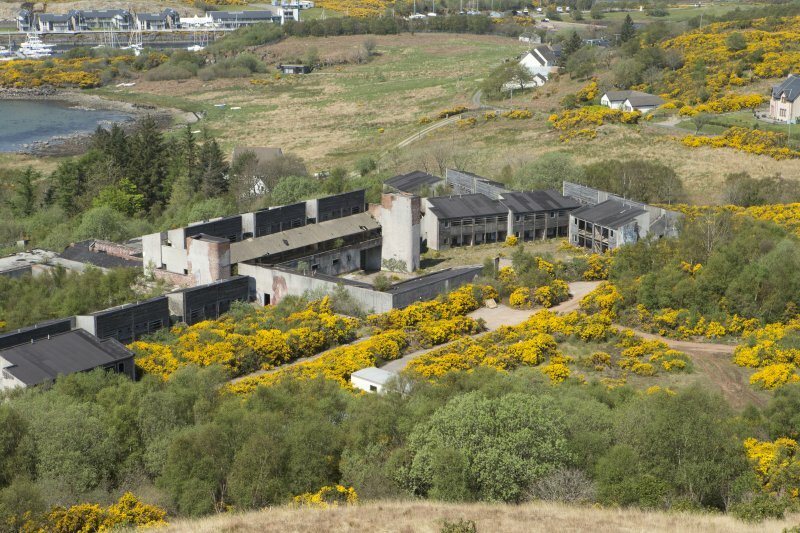 When it was finished, it should have housed up to 500 people in accommodation blocks. 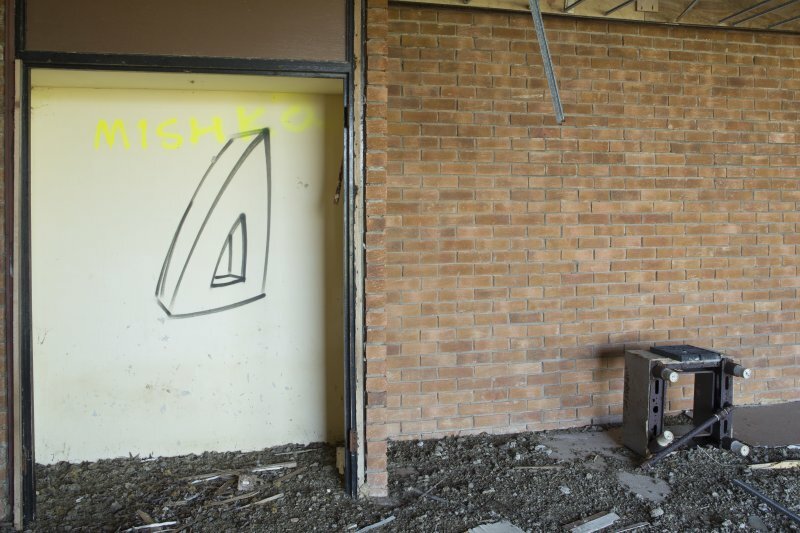 In addition, the workers were furbished with a central, multi-functional block that comprised a recreation space, kitchens, a laundrette and a TV lounge. But the workers never arrived. 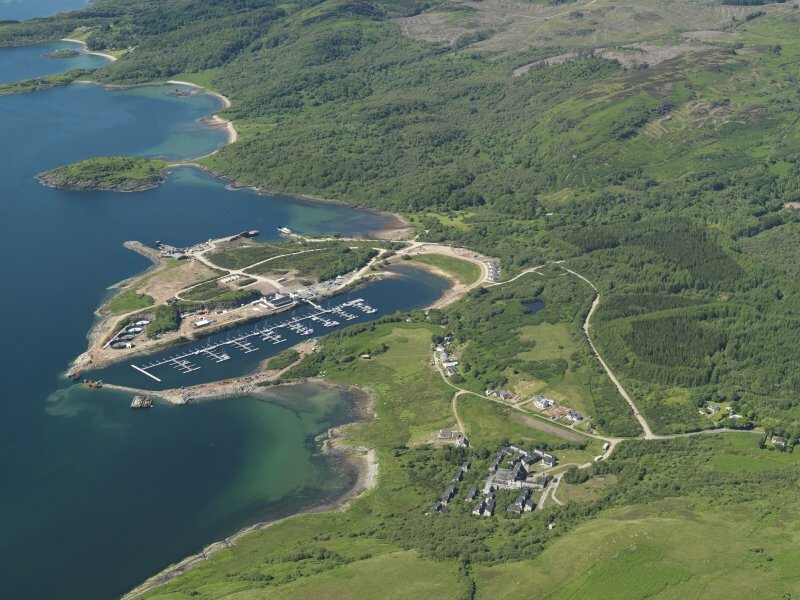 The oil industry never moved to Loch Fyne as it was deemed too expensive to build platforms on the west coast of Scotland. 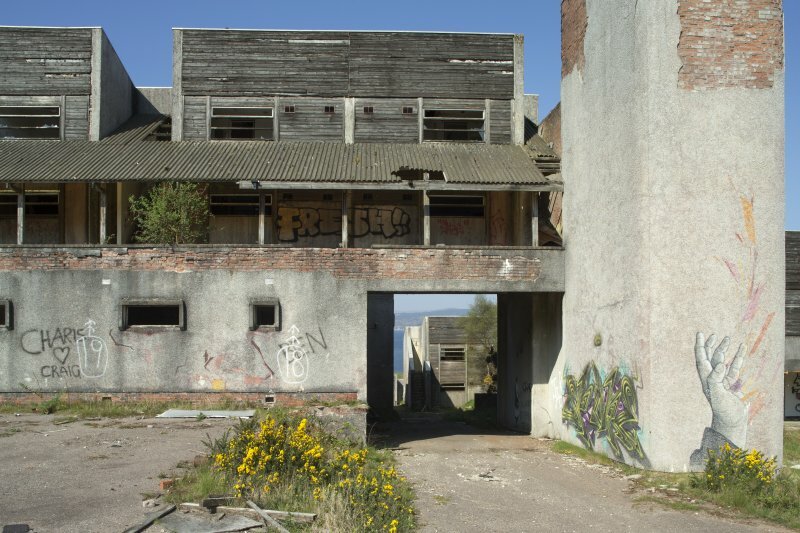 So places like the Nigg fabrication yard on the Cromarty Firth flourished and Pollphail, well it failed! 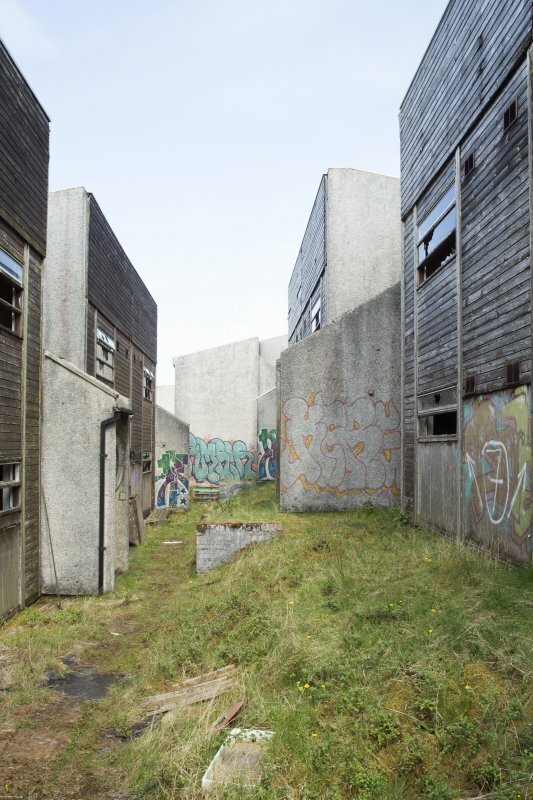 Over the past 40 years the terms ‘eyesore’, ‘ruin’ and ‘ghost village’ have all been applied to Pollphail during its abandoned lifespan. 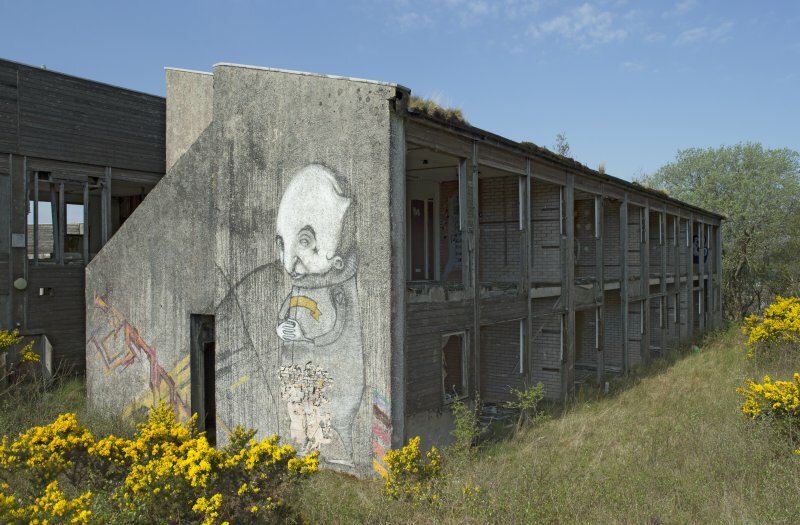 But underlying the story of decay and attempted rejuvenation projects, lies a different story: the hidden significance of an abandoned village and the unforeseen outcomes of artistic interventions at abandoned places. Over the past forty years the village has passed through a number of owner’s hands and the occasional plan would be presented that would redevelop the village. But as time moved on little happened apart from water ingress, damp encroached and the village took on the usual façade of decay. The occasional visitor and Urbex (urban explorer) would come past on their way to the Portavadie to Tarbert ferry, but little else changed. However, in 2009, a group of artists known as Agents of Change (@wearetheaoc) were invited by the owner to come to the village. Their aim, as they discuss in their short film (https://www.youtube.com/watch?v=AnKMqN0hJkg) was to paint the village. 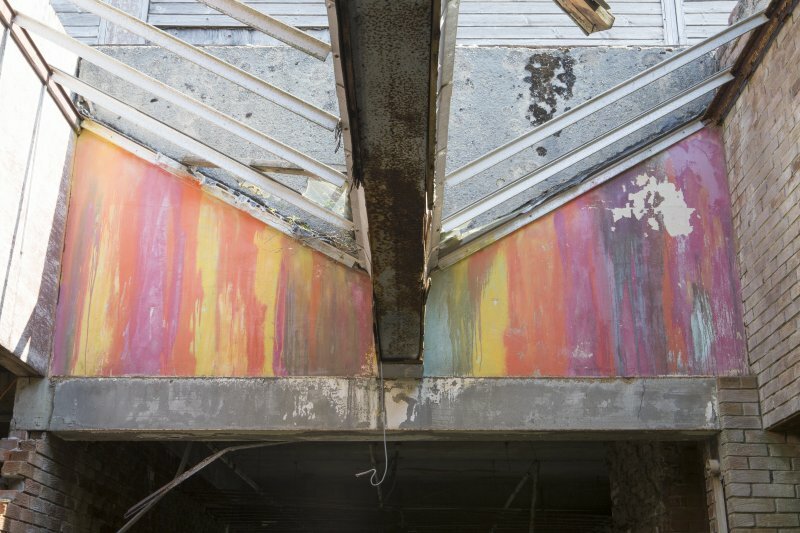 Their work transformed the grey-harled exteriors and mouldy interiors. 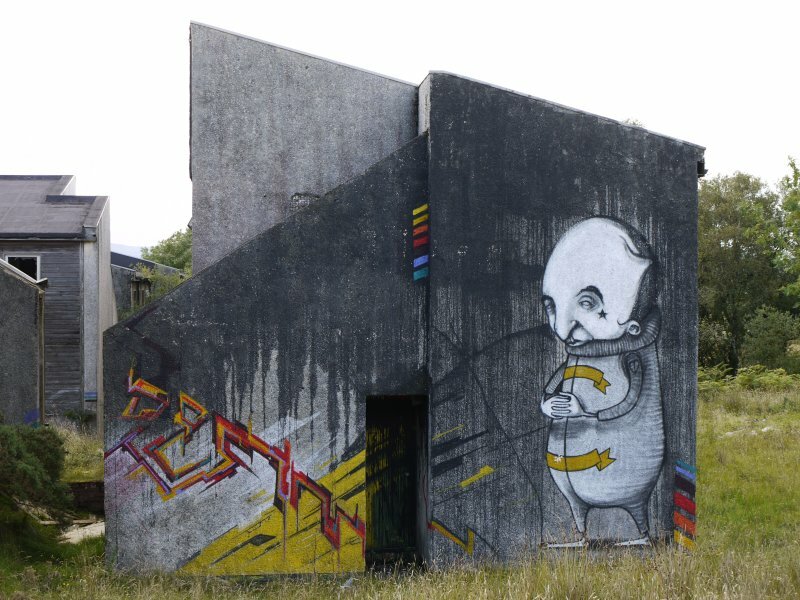 Their creative responses to walls the village presented to them ranged from painted mono-chrome figures to compositions by all six artists. They collaborated on gable-end murals and by the end of their 3 day intervention they had created over 80 pieces of work across the village. At the same time the village was not given a thorough standings buildings survey by the Heritage body charged with that role. 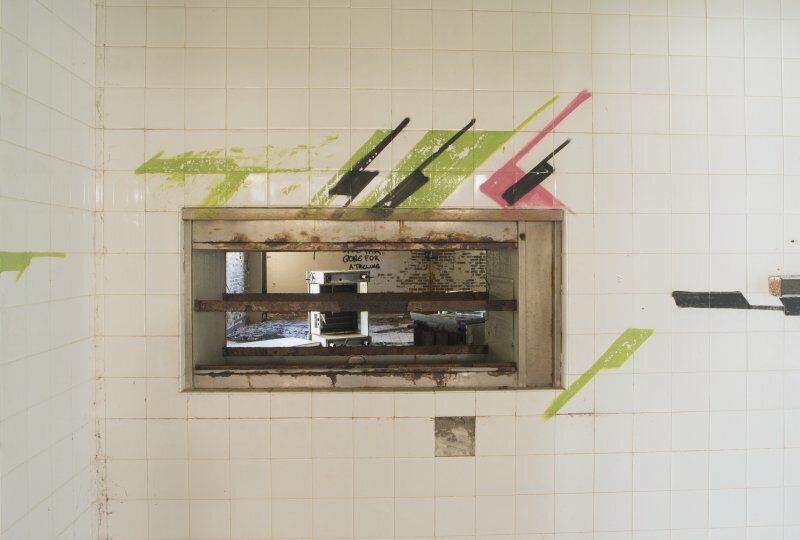 However, it was recognised that the combination of the built fabric and the graffiti art together had changed people’s perceptions of the place. 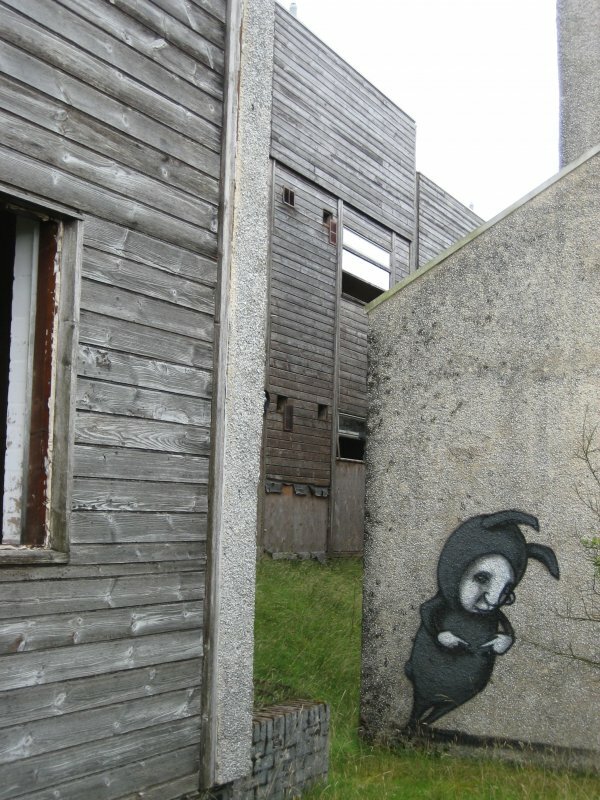 In addition, since 2009, Argyll council have put up brown ‘tourist’ signs indicating the route to Pollphail and calling it ‘Argyll’s Secret Coast Road’ and visitors began to turn up to see the ‘ghost village’ and its painted walls. 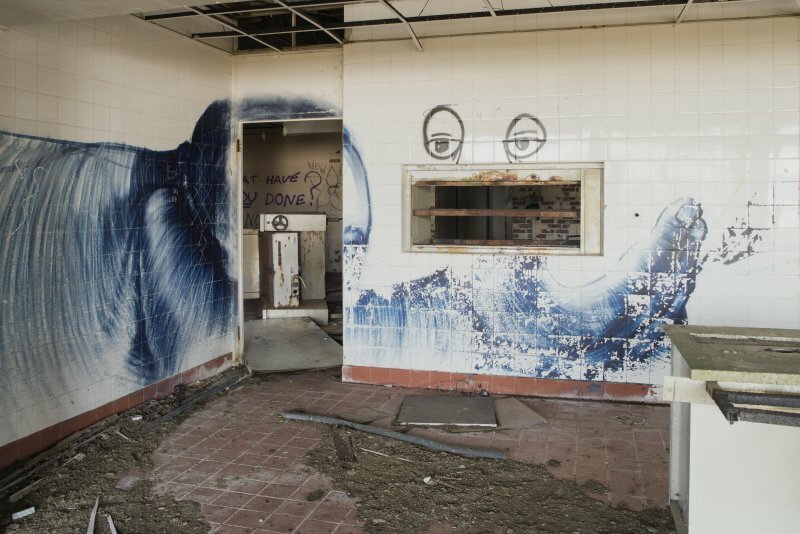 One particular image exemplified the artist’s astute use of location and how they went about telling the world about their work at Pollphail. 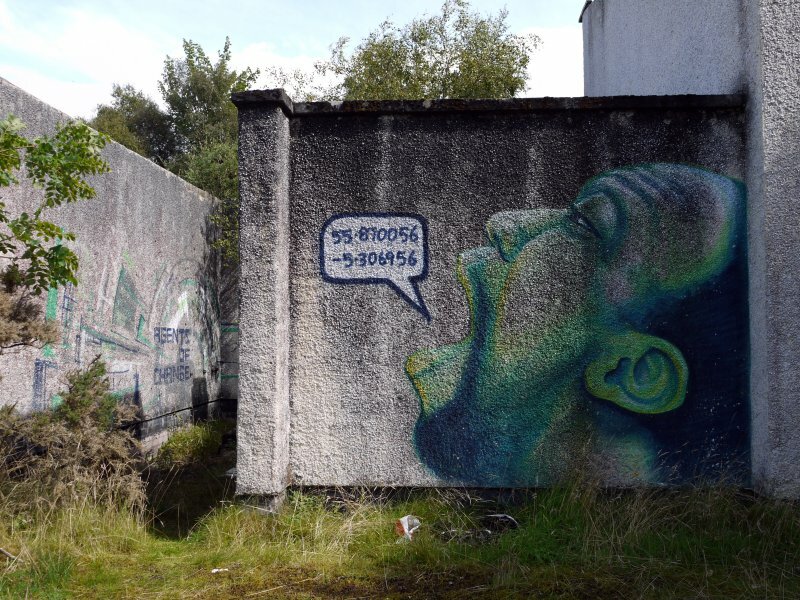 The image shows a human head speaking a string of numbers. The numbers in the speech bubble are the latitude and longitude co-ordinates of the village. 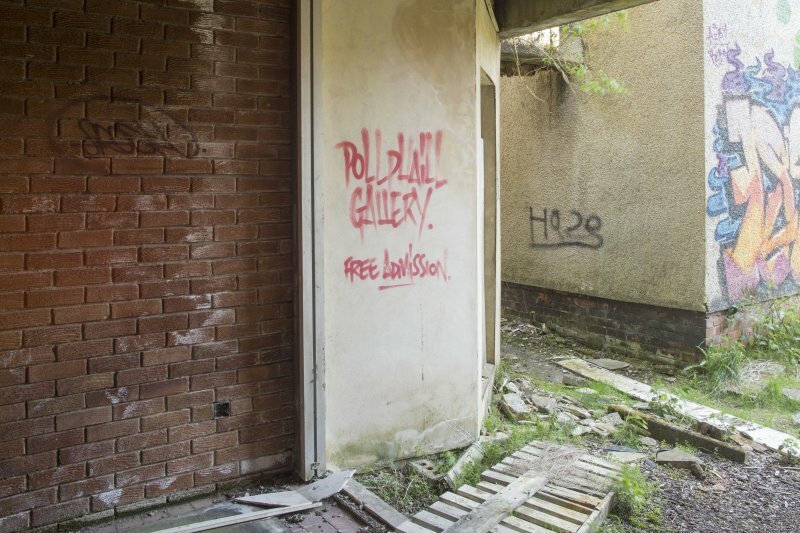 This use of digital location demonstrates the artist’s knowledge that images can be viewed globally and that location/place is still important to viewers. 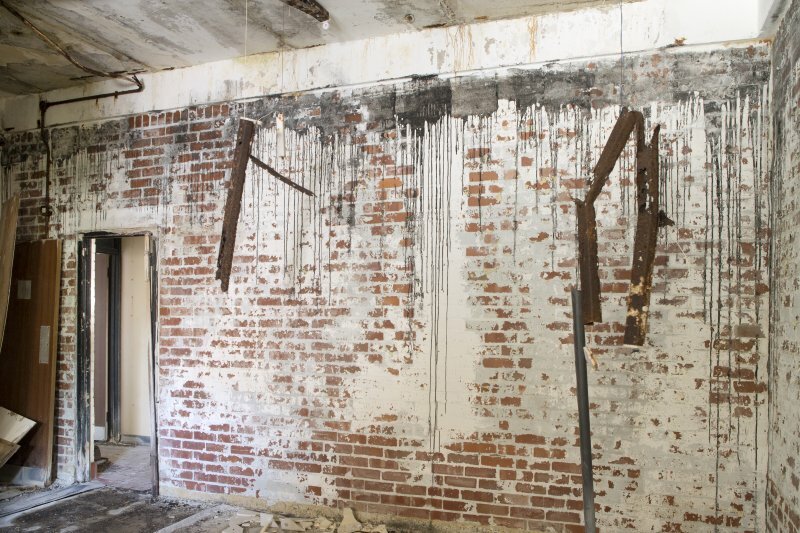 It also demonstrates that the artists don’t need to hang their works in a gallery to show them. 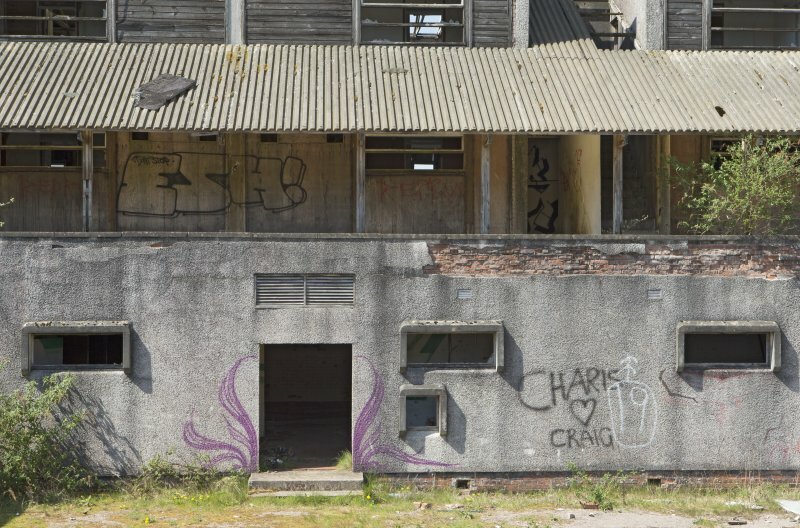 After Agents of Change visited the site other graffiti artists painted further contributions and the sense of a burgeoning gallery at Pollphail prevailed. 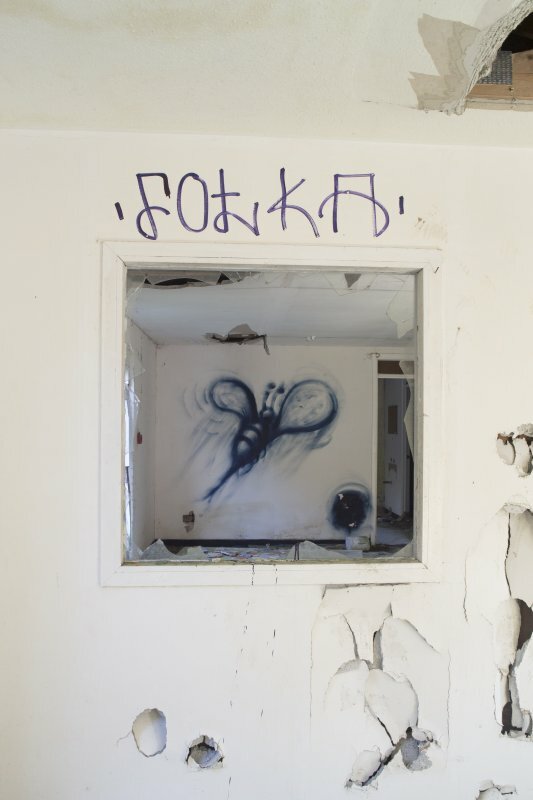 Visitors came from across the world to visit the ‘ghost village’ and it became a popular destination for locals and visitors. 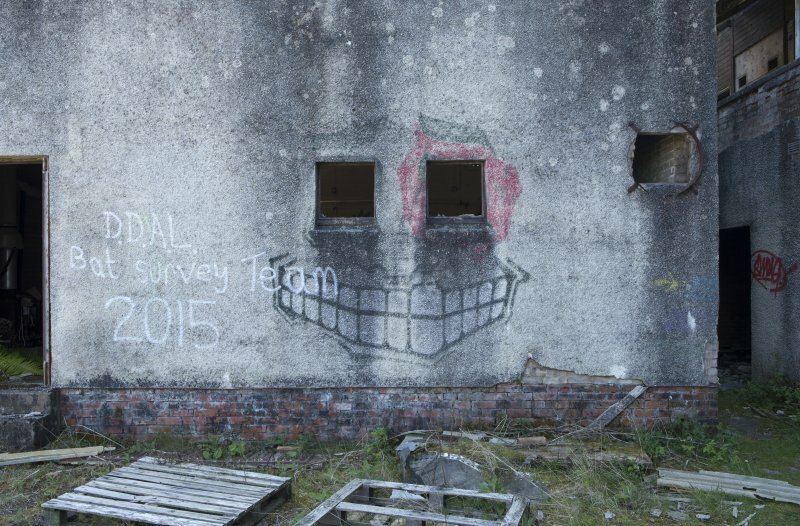 In 2016, Historic Environment Scotland recorded the village and the graffiti through photography and site survey. 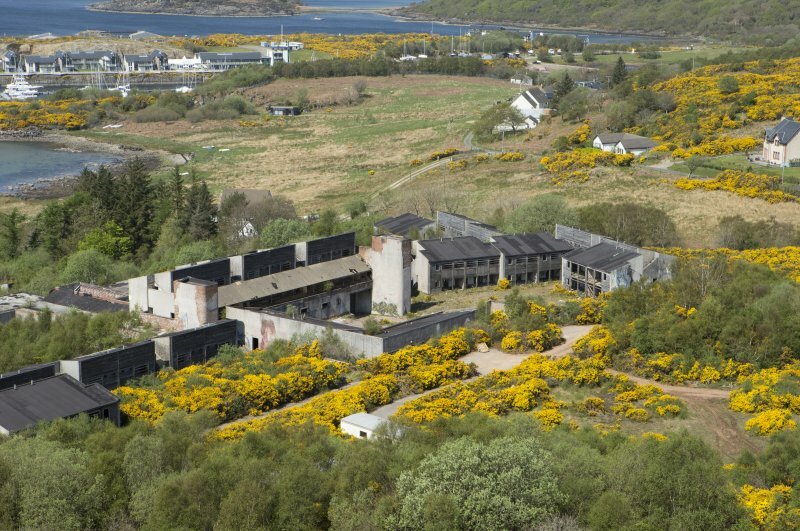 At the end of 2016 the village was demolished for a re-development scheme that will see a distillery, brewery and houses being built. 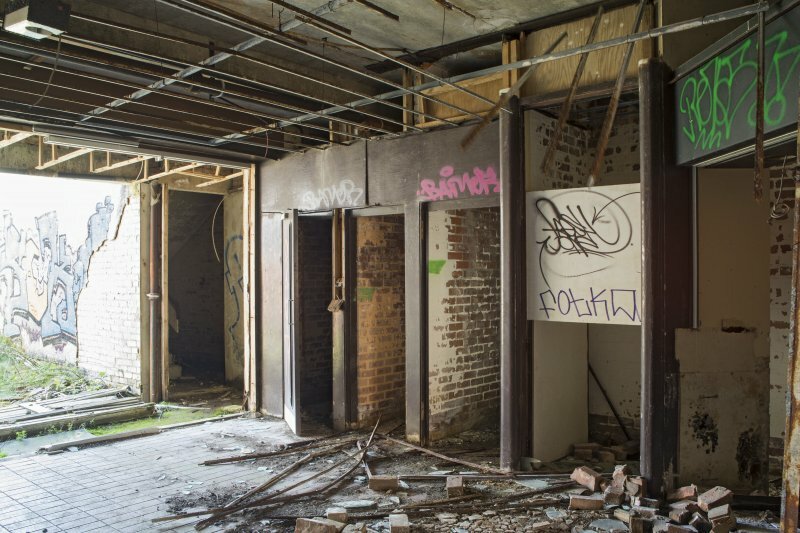 Pollphail illustrates that some ruins will never become designated sites, but that doesn’t mean that they aren’t important to people and significant to others. 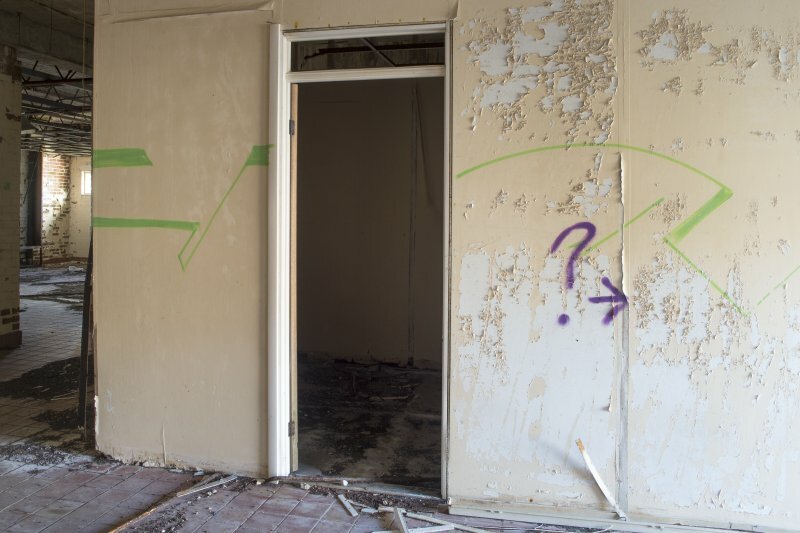 In the case of Pollphail it was the intervention by Agents of Change in 2009 that changed the significance of the abandoned ruin. 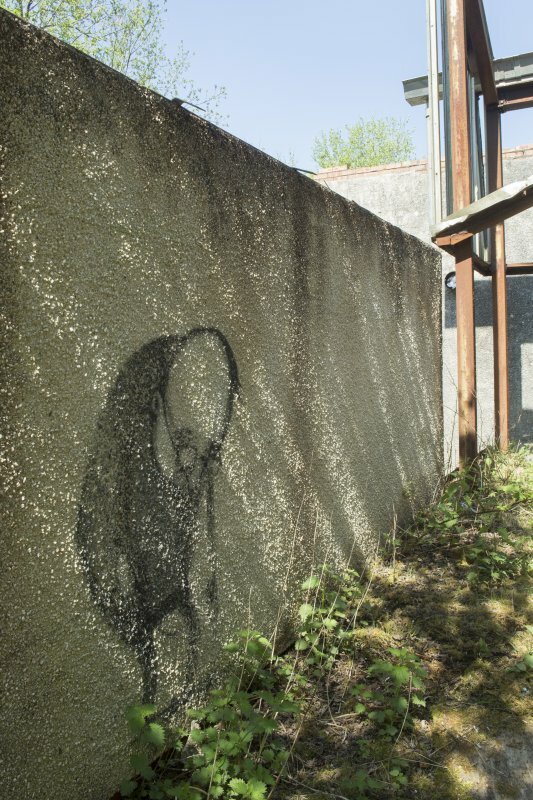 From the story of Pollphail it would appear that graffiti art can have an effect on people, which changes their idea of the significance of a place. 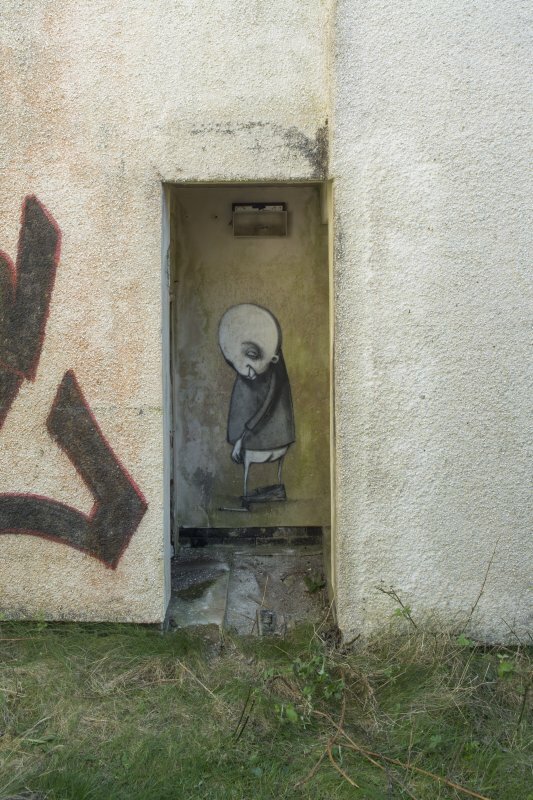 Who would have thought that graffiti could have such a positive transformative effect?